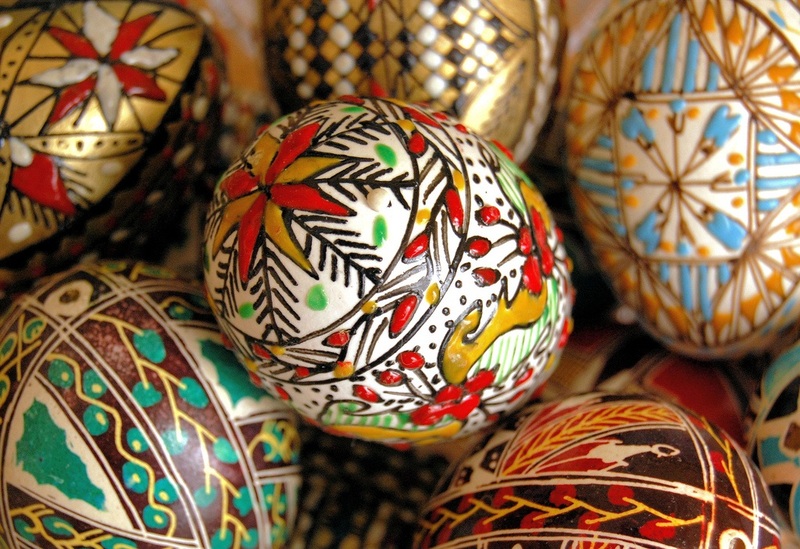 Easter – eggs – spring – fertility – rebirth. 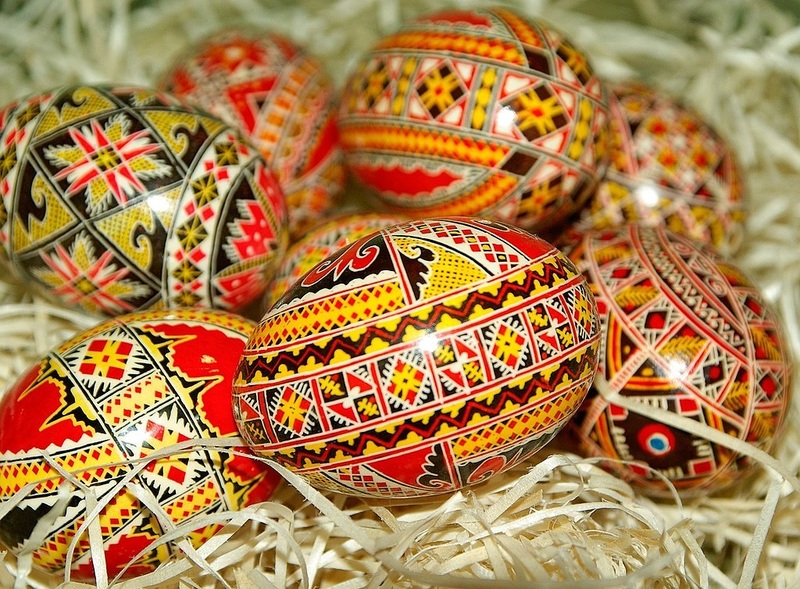 All part of a modern-day Easter celebration with ancient roots in pagan beliefs. 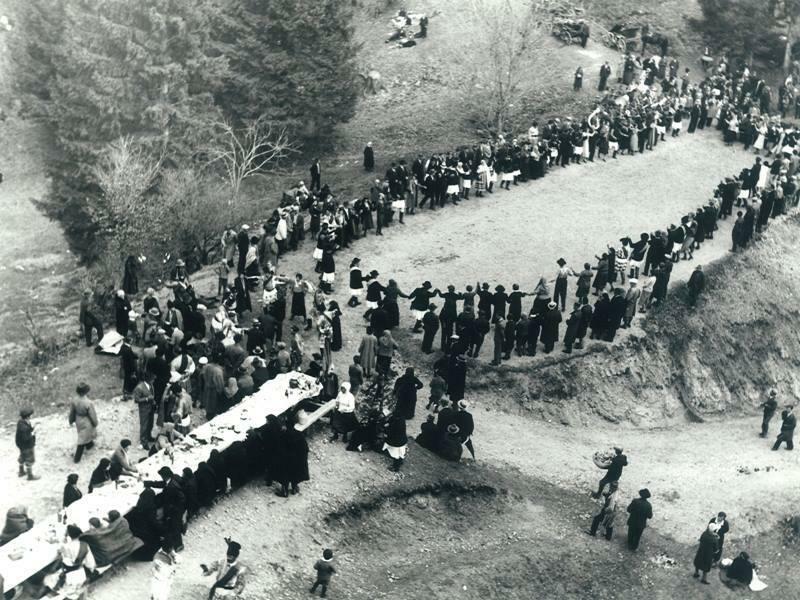 Every spring people celebrated the end of winter and the coming of spring, the rebirth of nature, and made wishes for fertility and happiness for the new year. 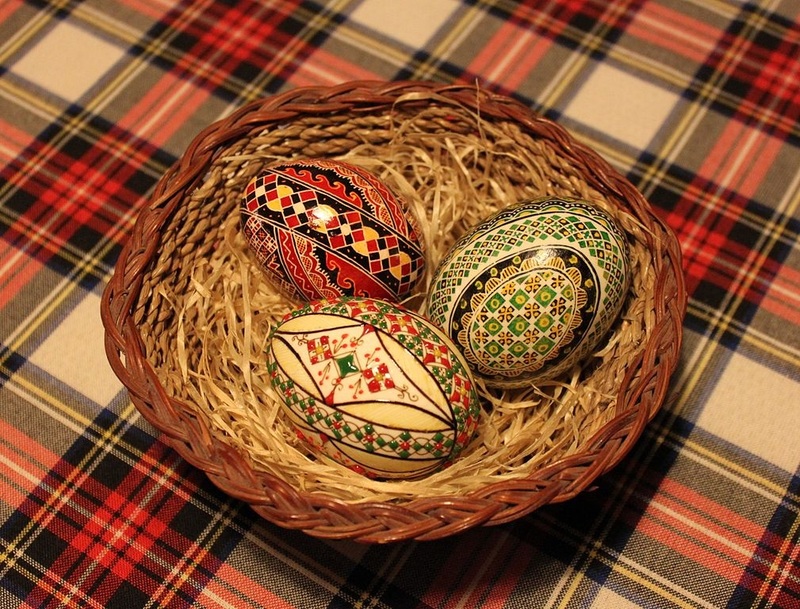 Christianity has intertwined the ancient celebrations with the crucifixion of Jesus Christ, whose rebirth – sacred in the Christian faith – symbolizes renewal, hope and joy. 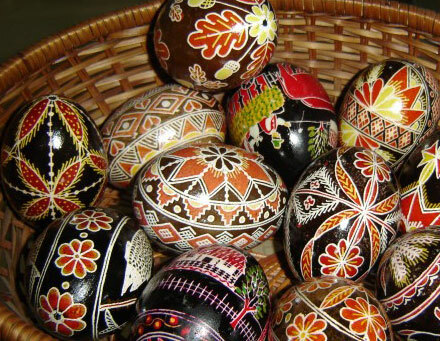 Romanian traditions have kept the use of painted hard-boiled Easter eggs which dates pre-christian customs. 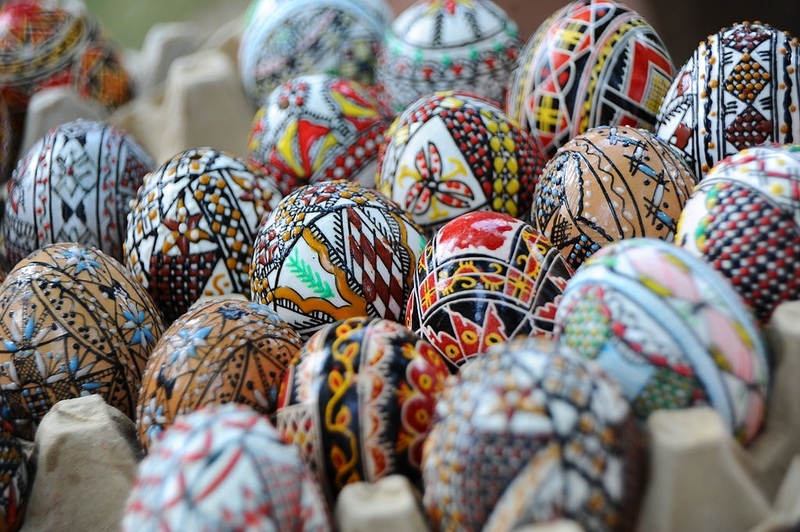 In cultures across the world – the egg is the symbol of new life, fertility and rebirth. 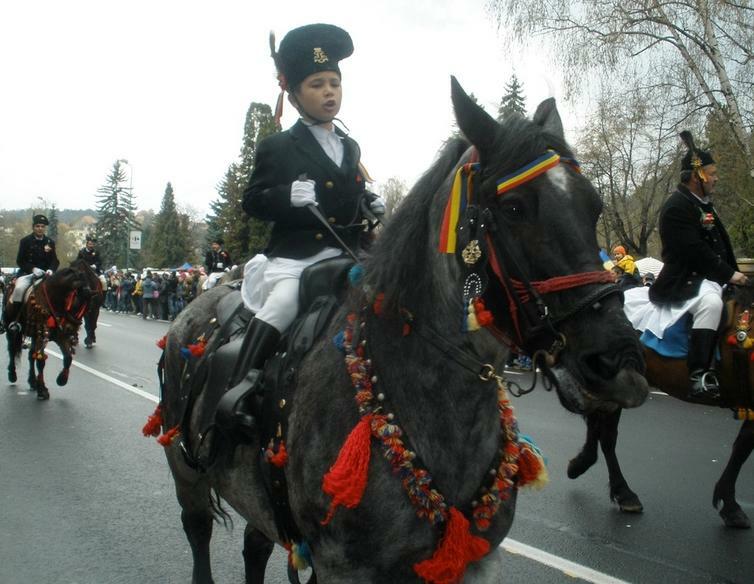 In Romanian tradition, egg tapping is done in order to show who will have good luck for the year. 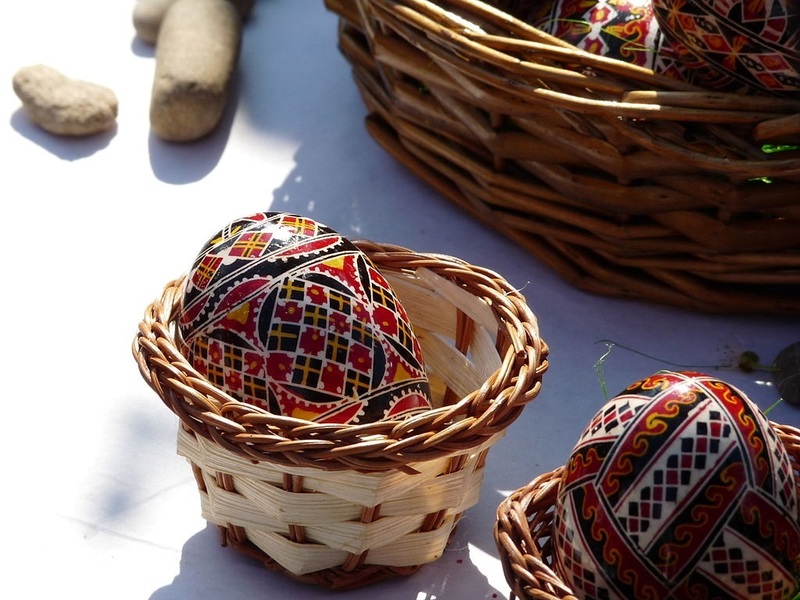 In Orthodox Christian custom, the egg tapping is accompanied by the saying “Christ has risen”. 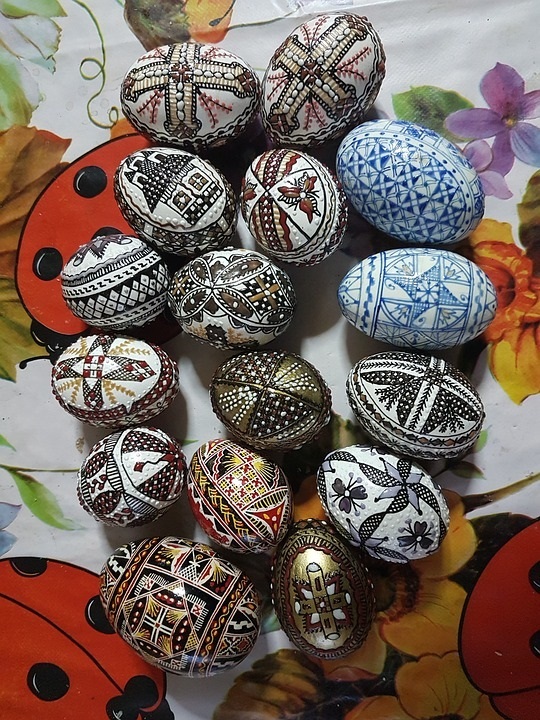 While most Romanian households have eggs painted in simple colors, the traditional Romanian eggs used a diverse array of patterns borrowed from the traditional Romanian dress. 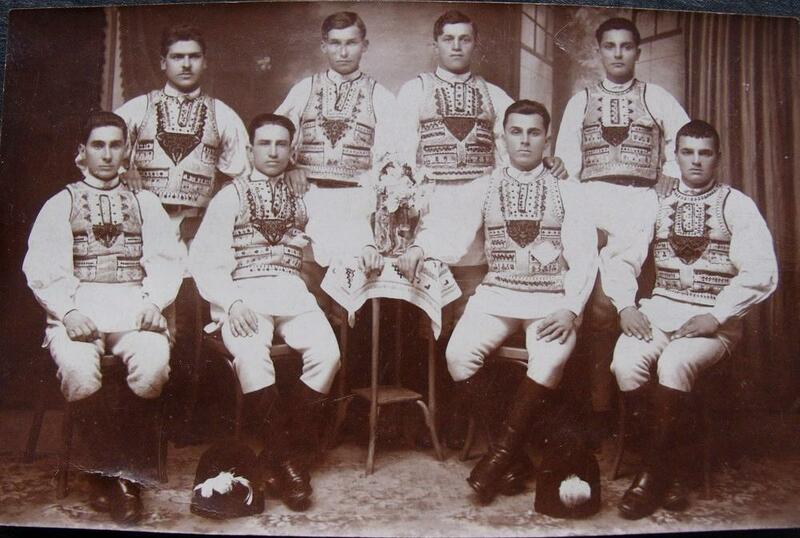 Romanian clothing uses motifs borrowed from nature and surroundings to denote people’s regional and cultural background. 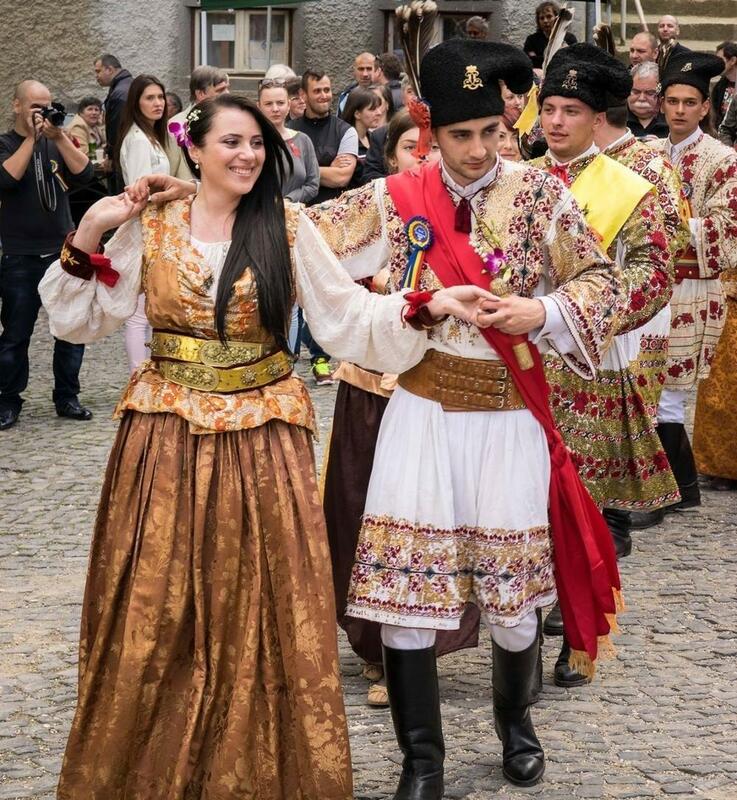 The Romanian dress also uses common pre-christian universal symbolism, like the tree of life or the infinity motif. 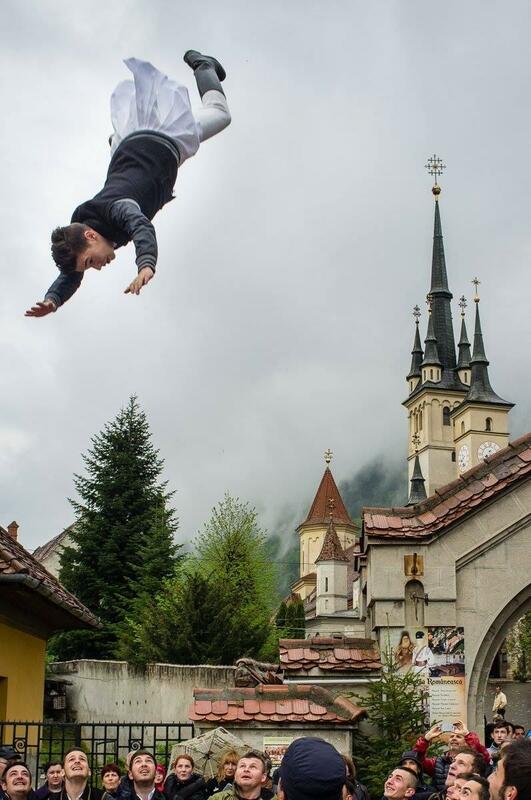 The Resurrection of Christ is a reminder of how life triumphs over death. 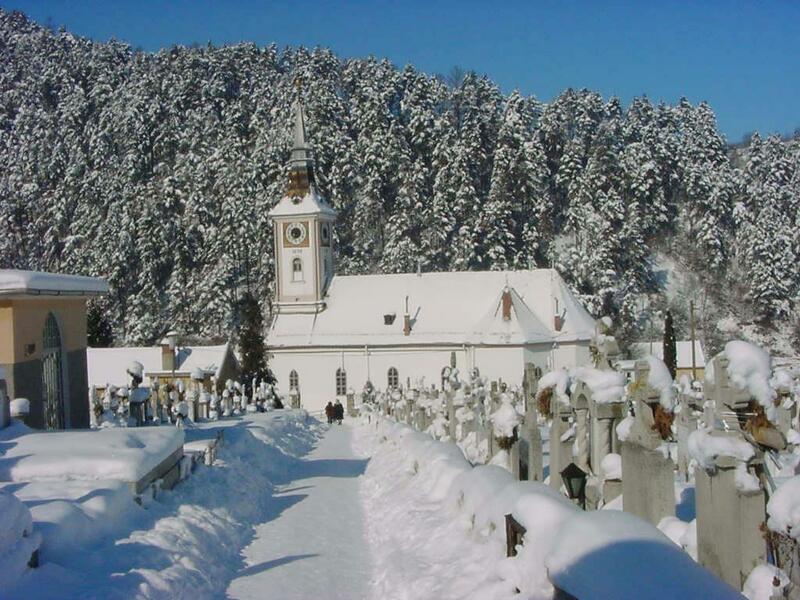 In ancient pagan customs, the Sun returns by defeating the dark cold winter and bringing fertility, through which nature comes back to life. 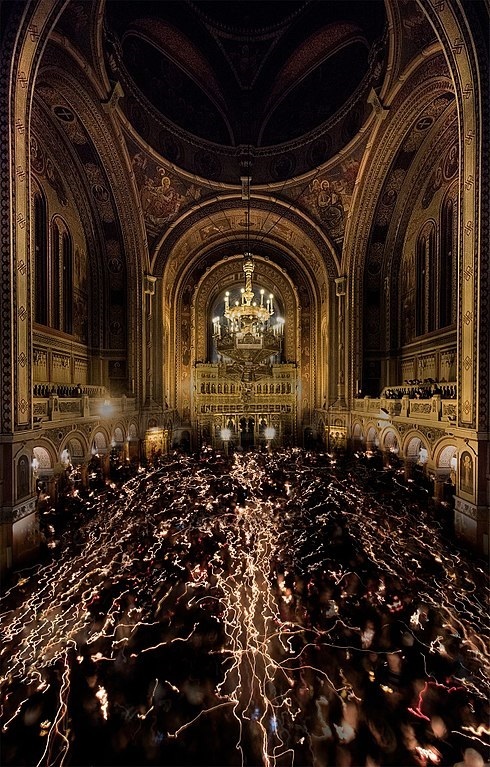 The Sun is reflected today in the light carried during the Easter vigil at midnight. 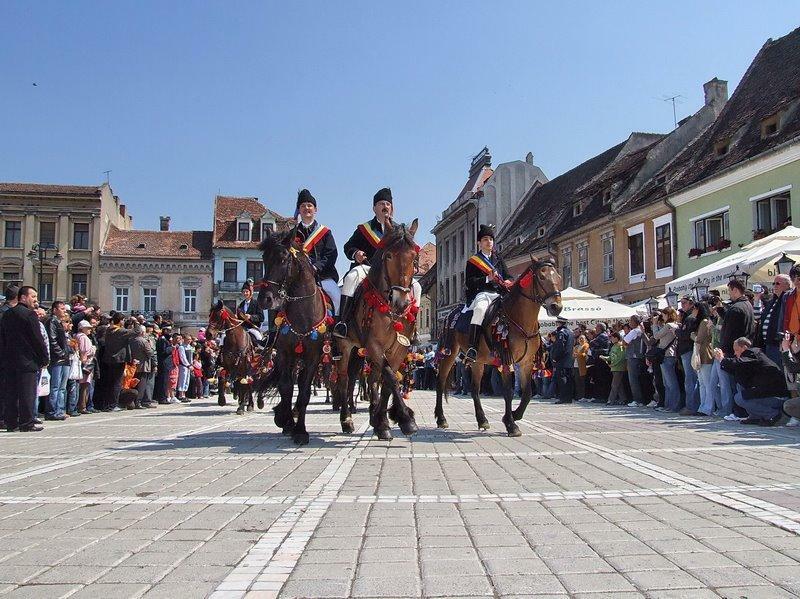 “Junii Brasovului” are a group of horsemen from Schei – an old Romanian neighborhood located near the citadel, today a district of Brasov. 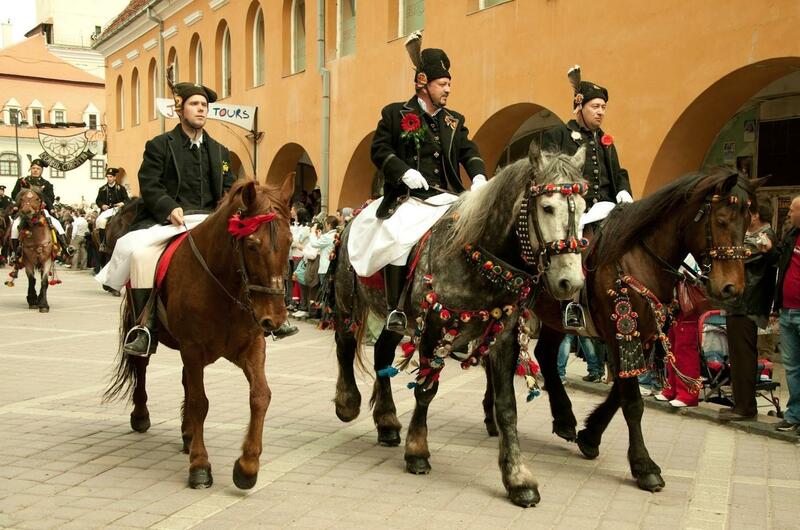 Every year during spring they hold a special feast which represents a complex of Christian Orthodox traditions and pre-Christian rituals inherited from distant ancestors. 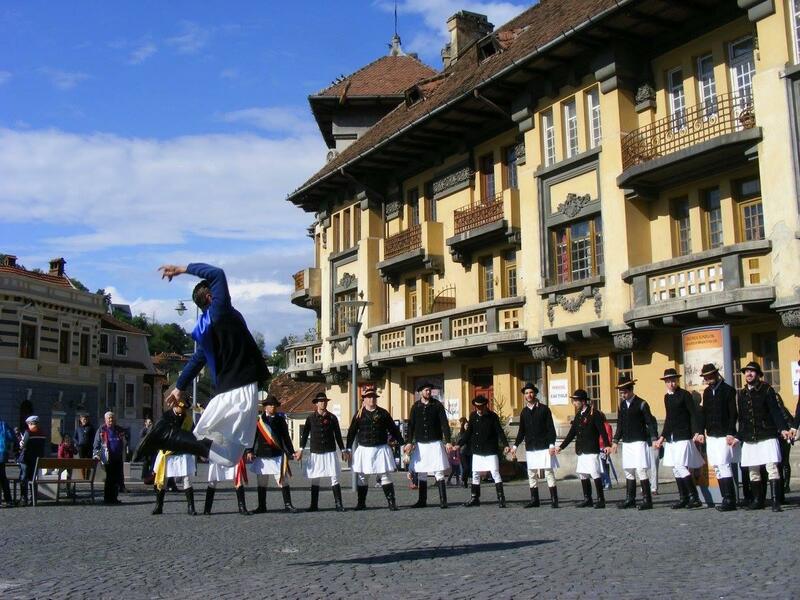 The spring ritual is related to the ancient cult of the Sun which was joined with the resurrection of Christ – both signifying the renewal of life. 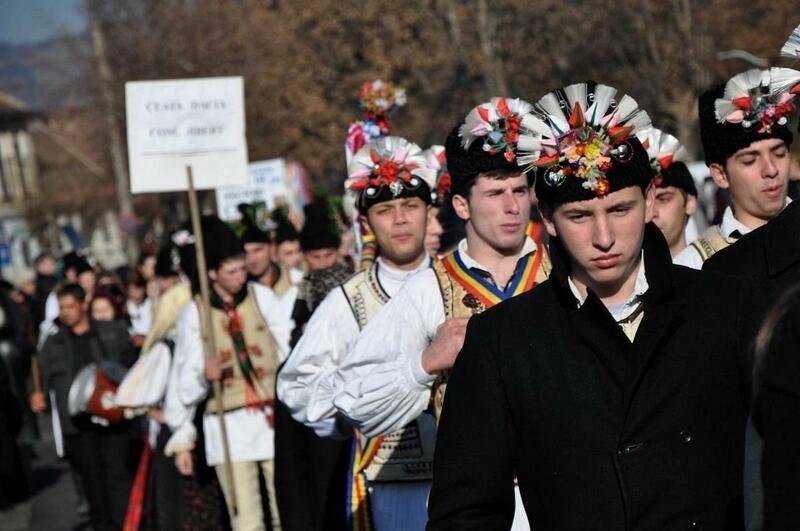 The spring ritual was forbidden in 1949 through a decree signed by Ana Pauker but was reintroduced by Nicolae Ceausescu in 1967. 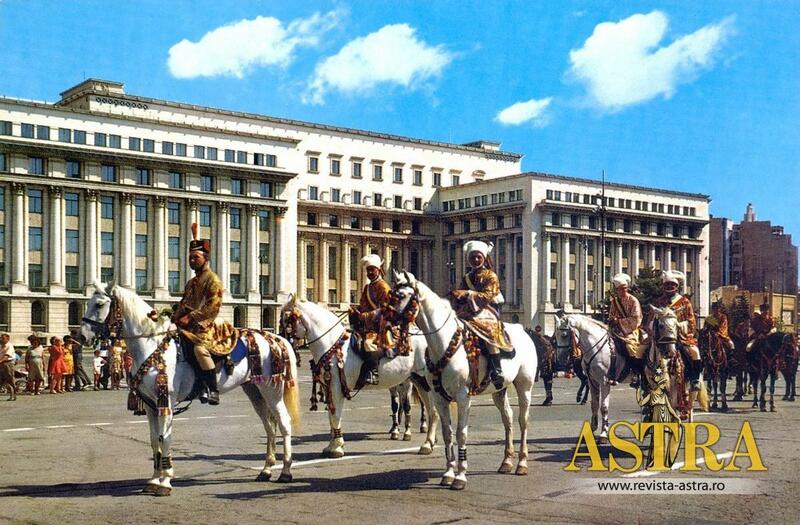 The Juni on a visit to Bucharest in front of the Romanian Atenaeum (dated 1971). 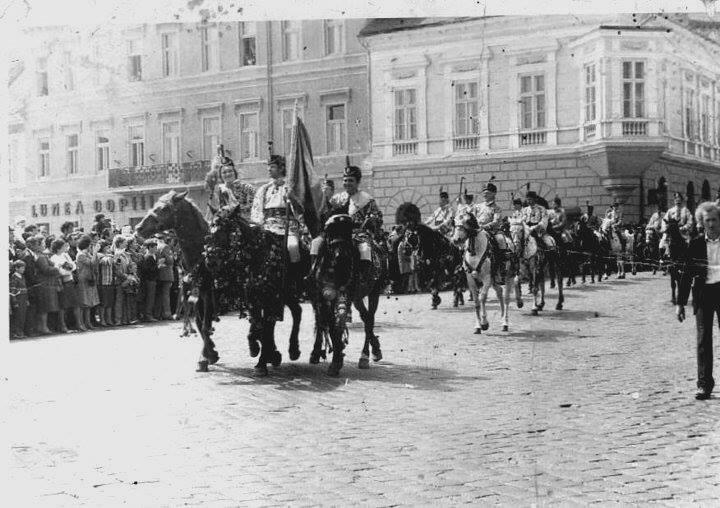 The Juni ritual was forbidden in 1949 through a decree signed by Ana Pauker but was reintroduced by Nicolae Ceausescu in 1967. 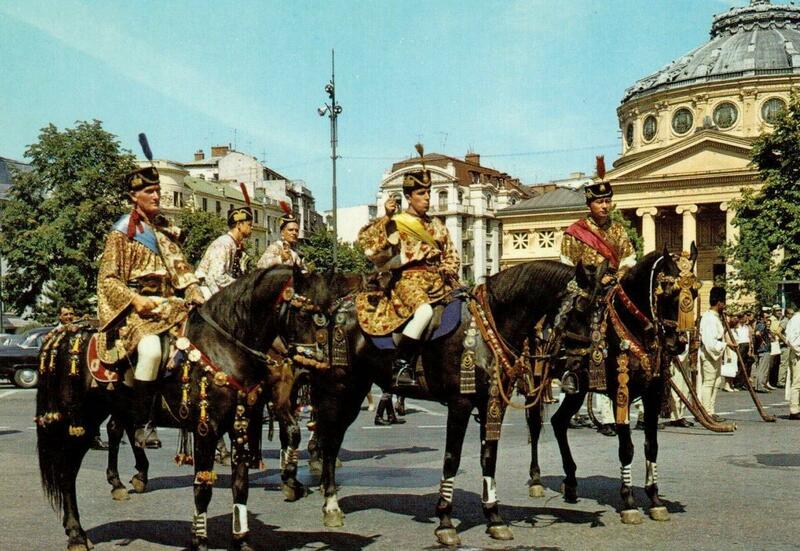 The Juni on a visit to Bucharest in front of the Romanian Government (dated 1970). 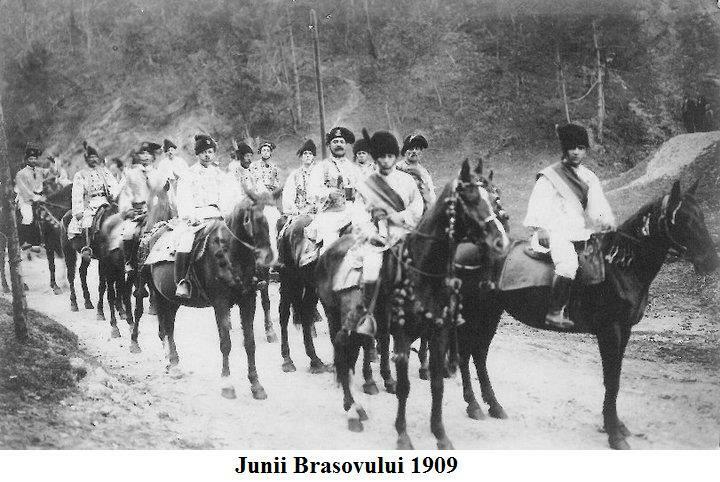 The Juni ritual was forbidden in 1949 through a decree signed by Ana Pauker but was reintroduced by Nicolae Ceausescu in 1967. 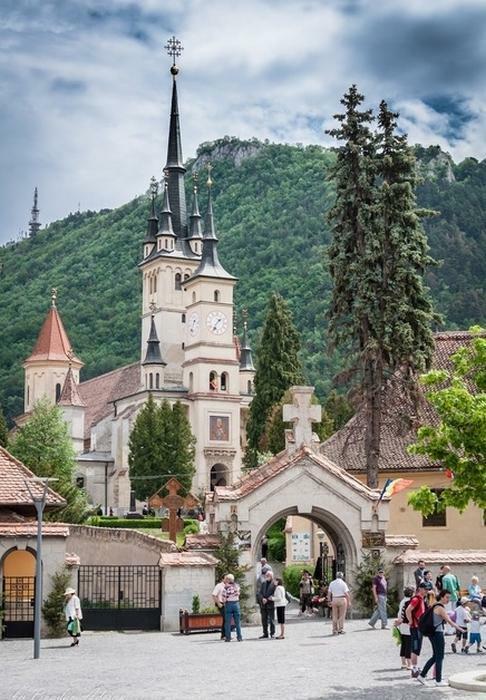 Brasov citadel, situated on a commercial route at the border of Vallachia and Transylvania, was a flourishing trading center. 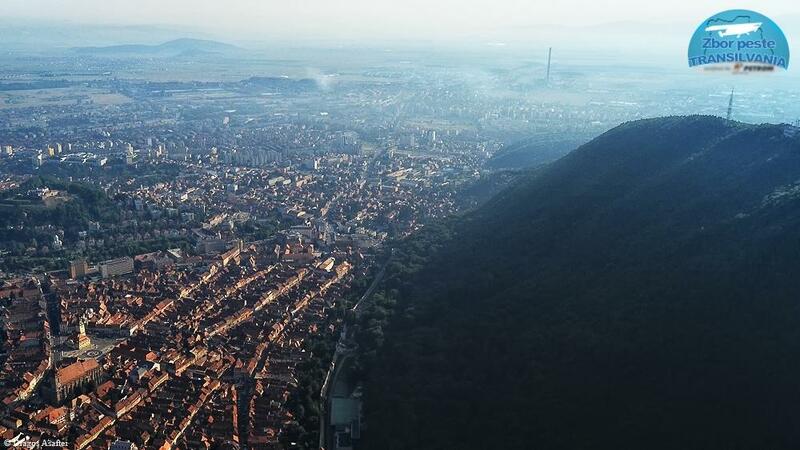 The citadel was built at the mouth of a mountain valley. 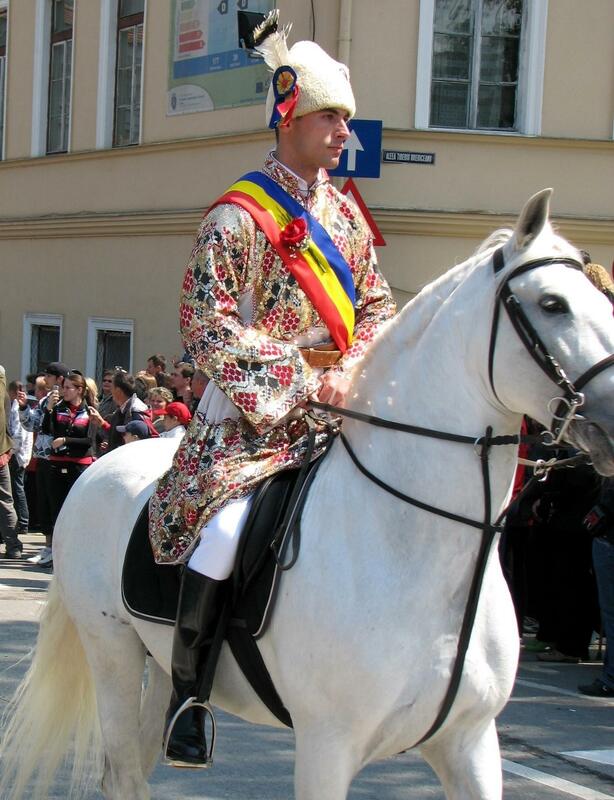 During the Saxon rule of the 13th to 17th century following the Unio Trium Nationum military pact, Romanians lost their civil rights while Saxon merchants and Hungarian nobility gained privileges. 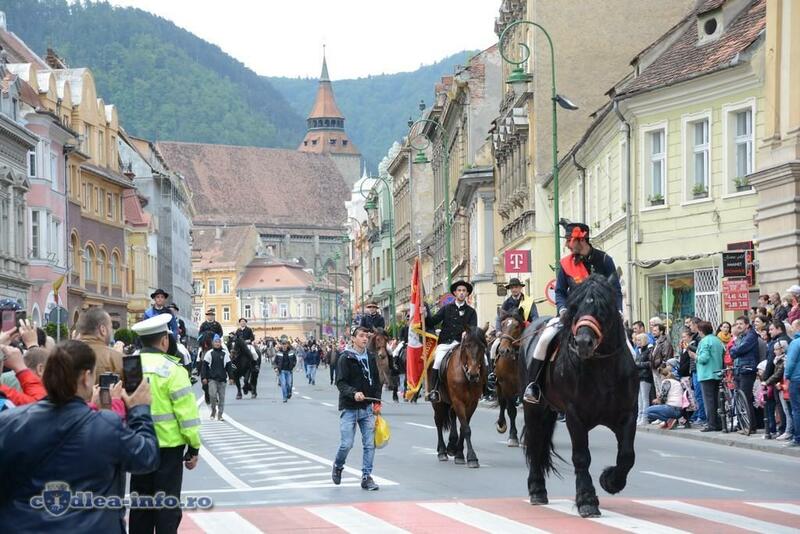 In Brasov they were forbidden from owning property inside the fortress. 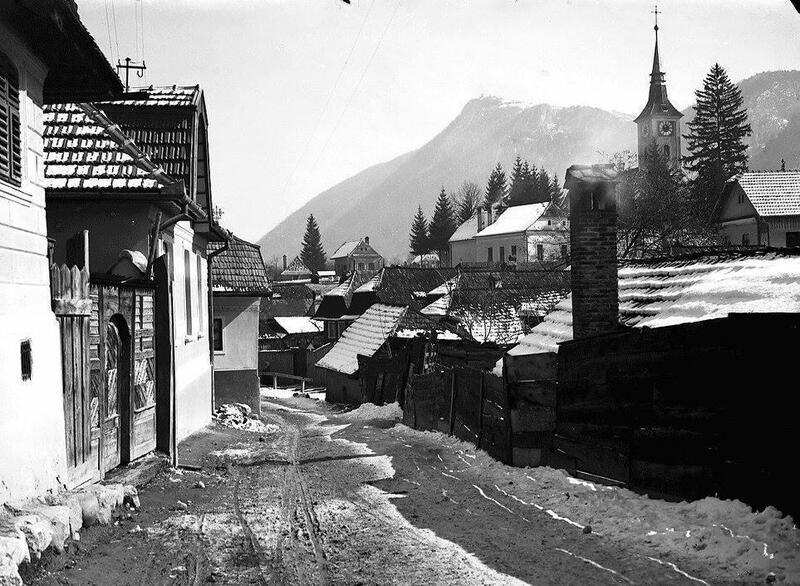 Called Vallachians at the time, they were living outside the wall in the neighborhood named Schei, also called Obere Vorstadt (Upper Suburb) or Wallachische Vorstadt (Vallachian Suburb) by Germans. 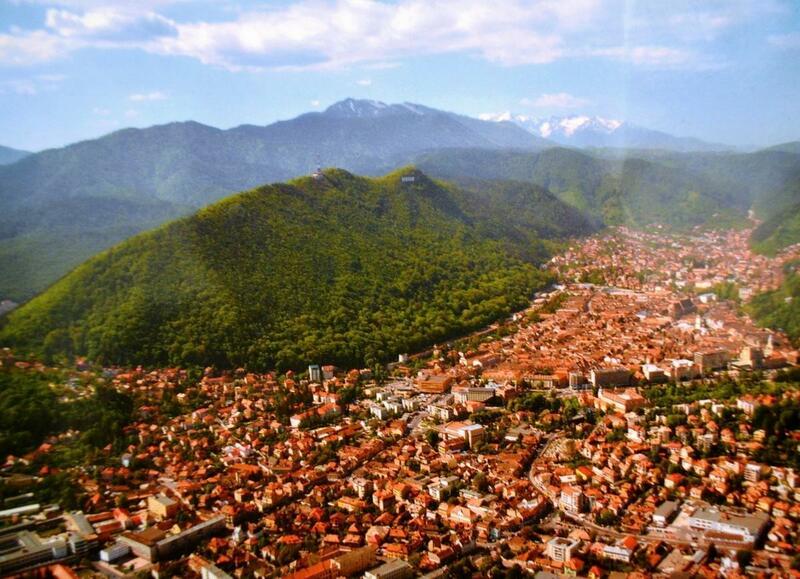 Aerial panorama of Brasov – the old citadel is located at the mouth of the valley, with Blumenau and Altstadt suburbs nearby. 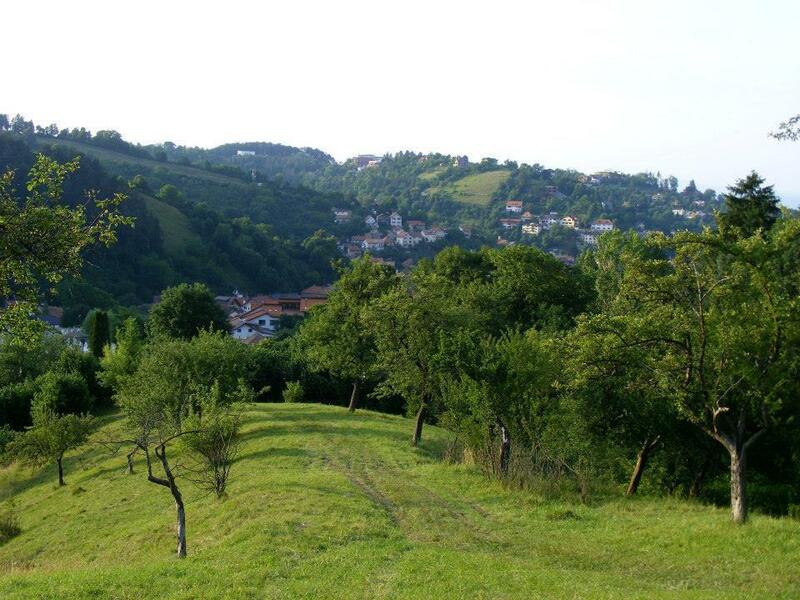 On the opposite side – Schei is located further down the valley between mountains. 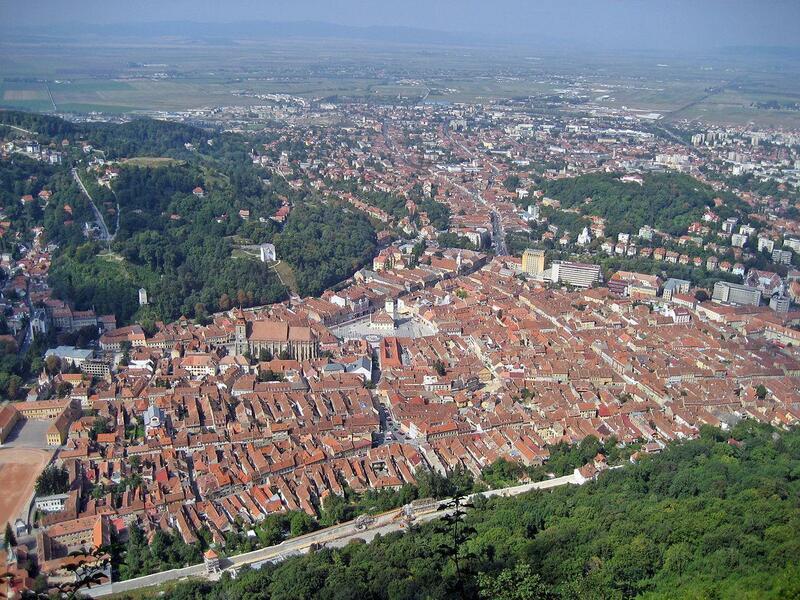 View from Tampa mountain over Brasov’s old citadel and its Saxon and Hungarian suburbs. 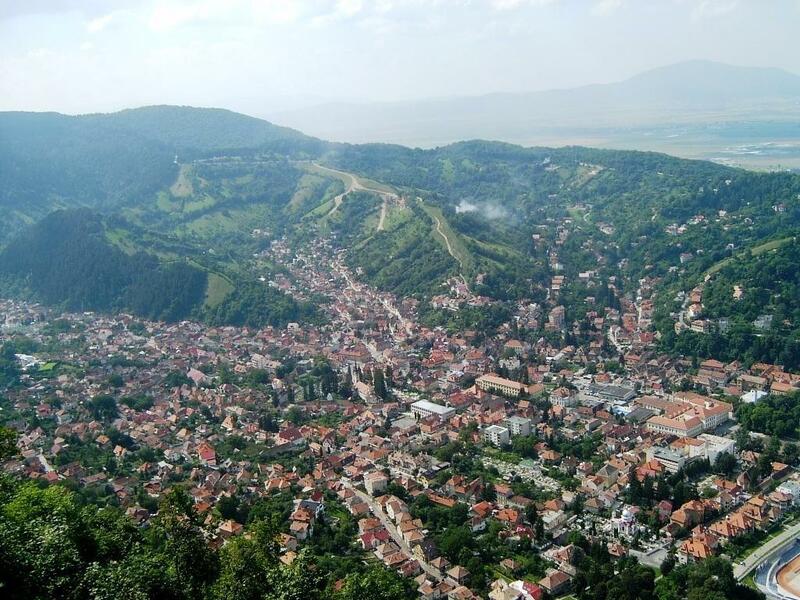 Behind it is the Bârsa plain (Câmpia Bârsei). 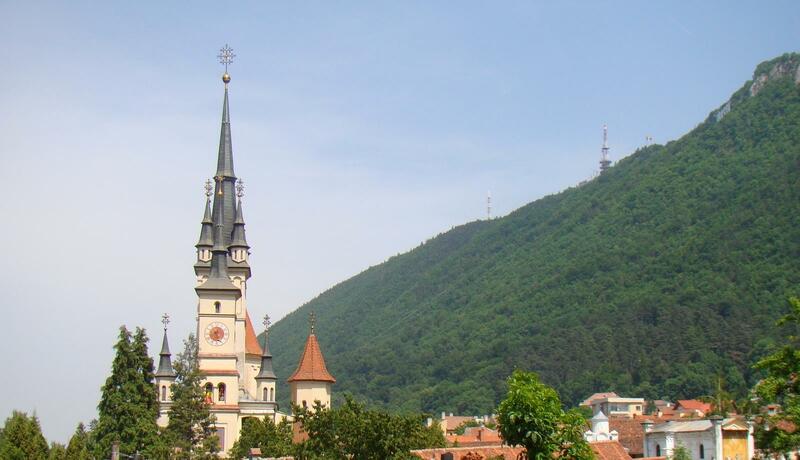 View from Tampa mountain over Schei (right), Romanian suburb near Brasov’s main citadel. 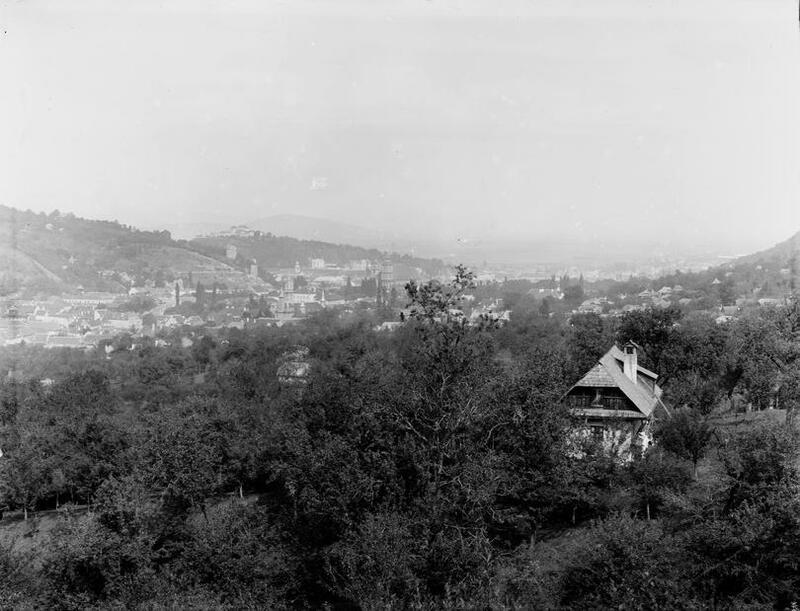 From Schei onward begins the long Carpathian mountain chain, visible in the background. 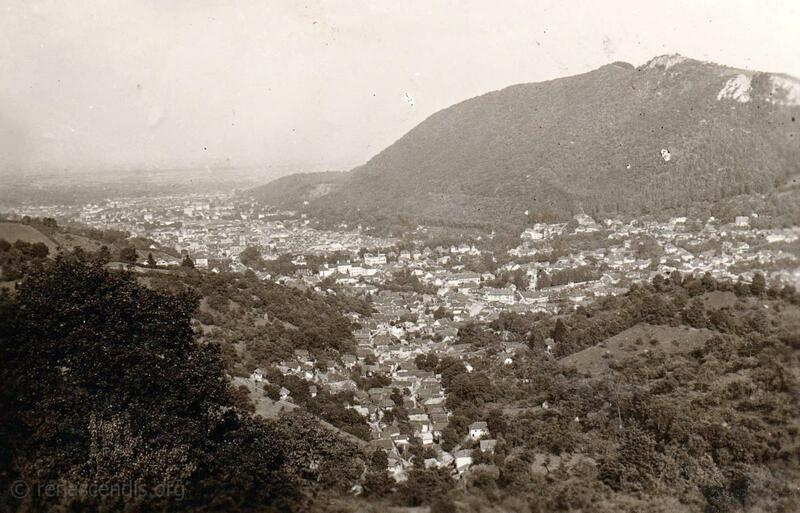 Left of Tampa is a newly built district in a narrow valley. 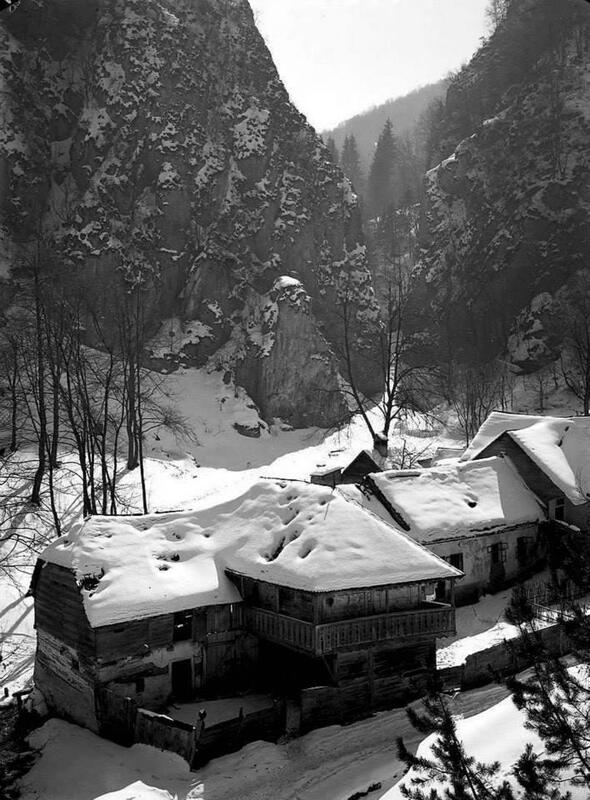 Schei is located in the south of the citadel, in between mountains. 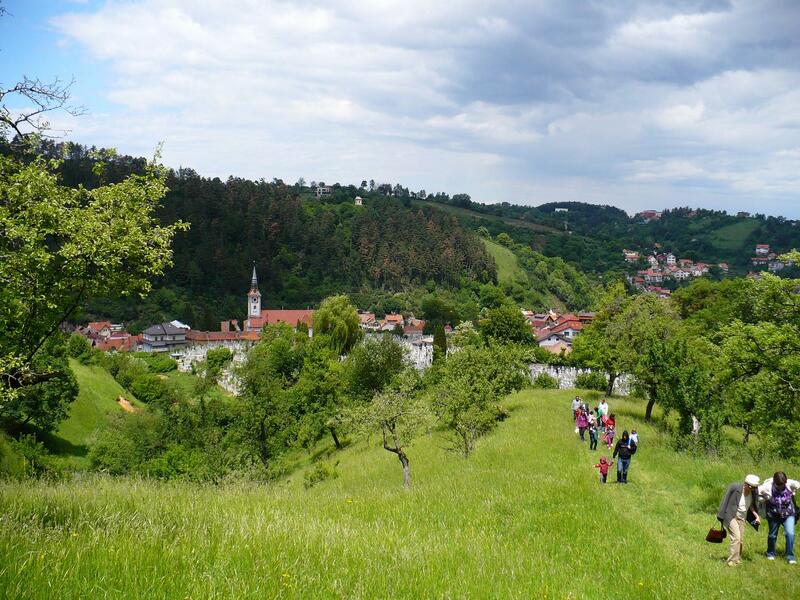 On the opposite side of the citadel, the Hungarian-Saxon populations were living in two neighborhoods: Blumenau (Blumana in Romanian) inhabited by Hungarians, Altstadt (inhabited by German farmers). 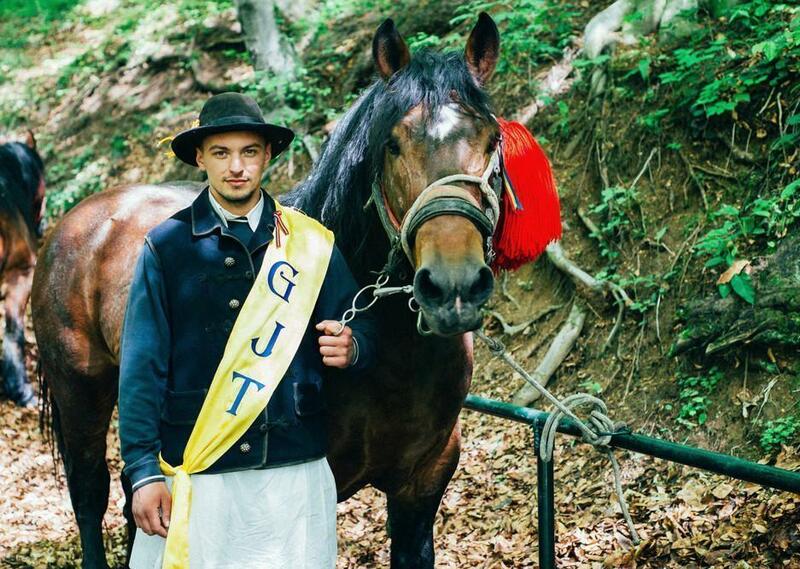 “Juni” is an old word that means “young unmarried men”. 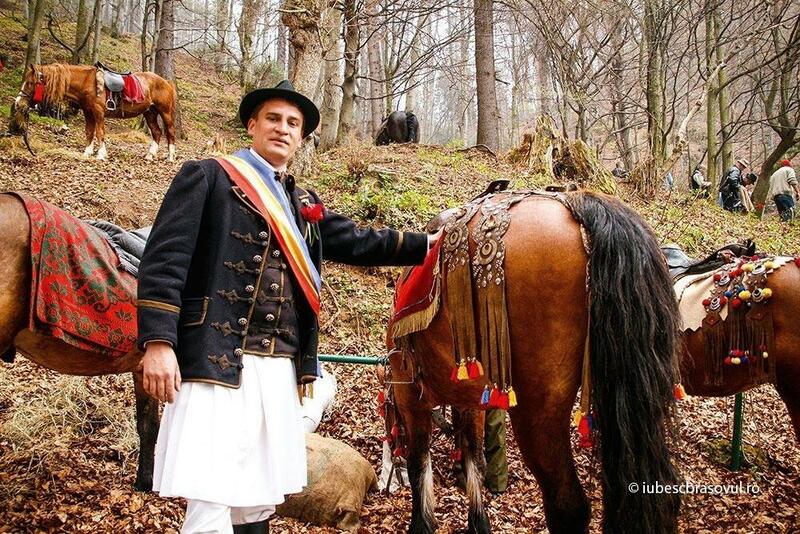 Juni may also be called “feciori” which has the same meaning. 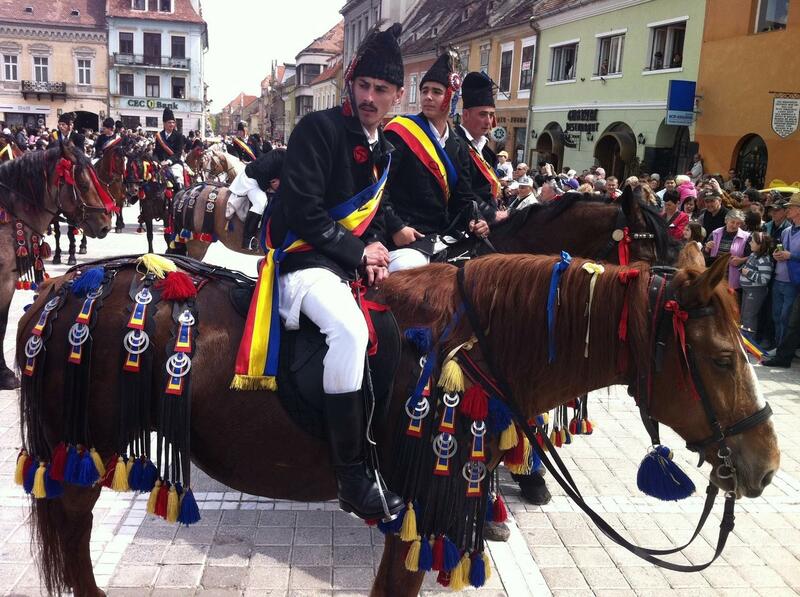 In Brasov in particular, Juni applies to men of all ages, divided into married (old juni) or unmarried (young juni). 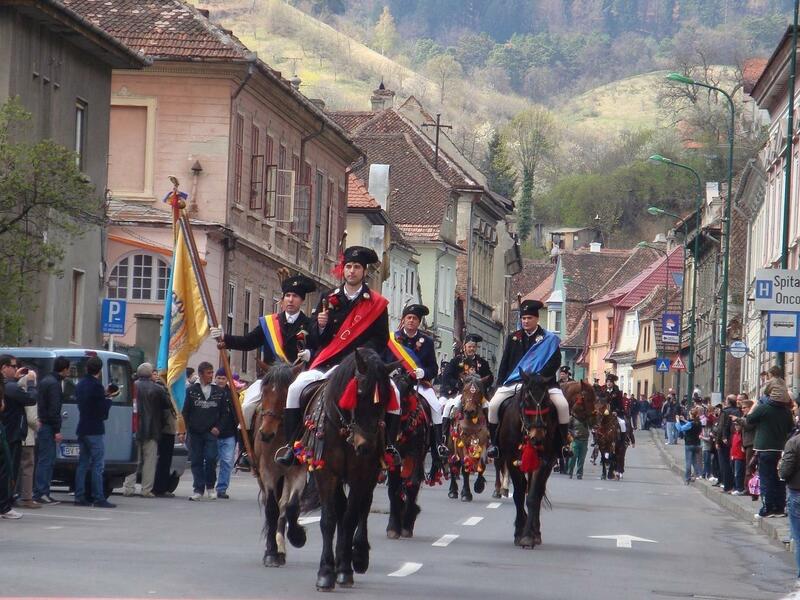 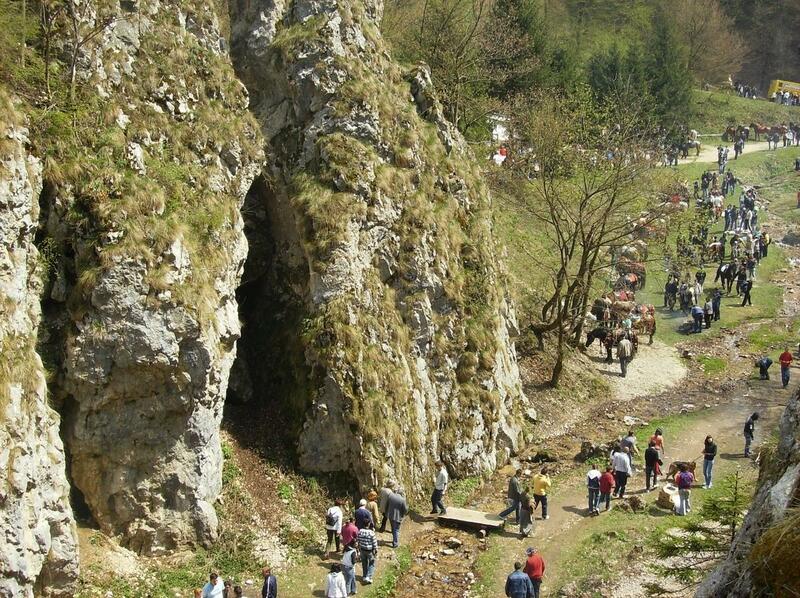 Although the Juni of Brasov have their specific ways of celebration, the Juni groups are found all throughout Romania. 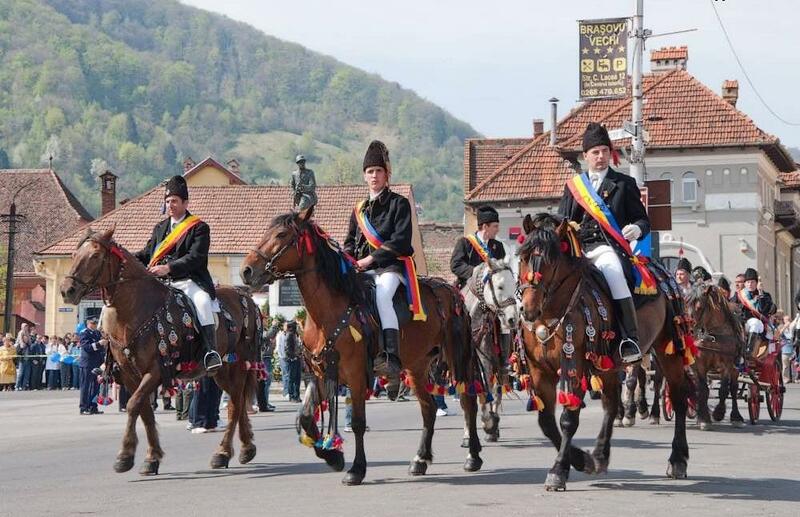 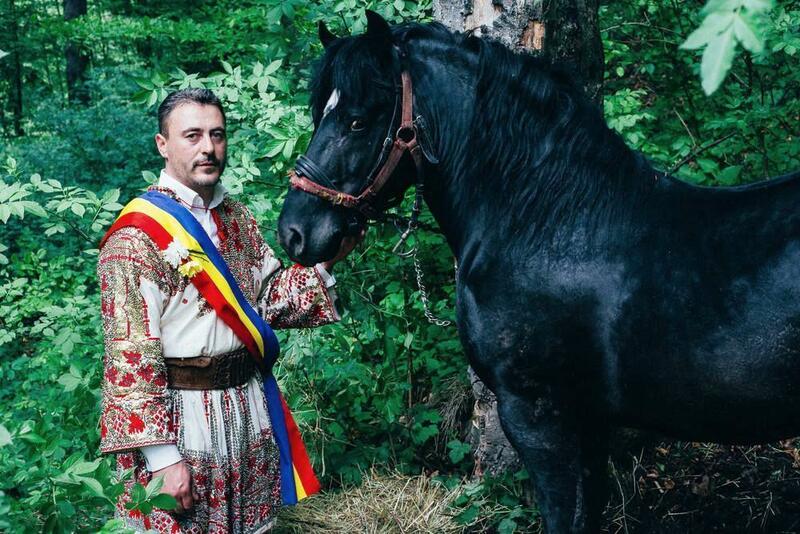 Up until recently, most Romanian villages had Juni groups but the forced urbanization, in addition with new EU laws which limited horse riding, has had a negative effect on these traditions. 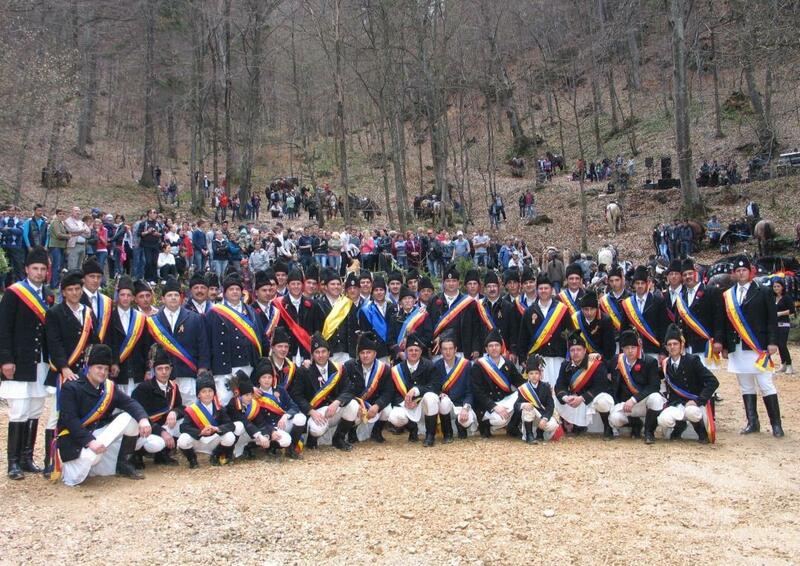 The young men of a community reunite in a group called “ceata” (ceata de feciori, ceata de juni) during the winter solstice and spring when they perform pre-Christian songs and rituals; the purpose of these rituals is to help perpetuate fertility during winter, and to celebrate the return of the sun during spring. 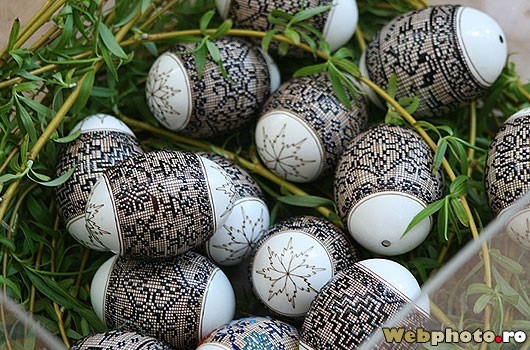 Only in recent times did the Christian element blend with the pagan traditions in such a manner that today they coincide with the main Christian holidays – Christmas and Easter. 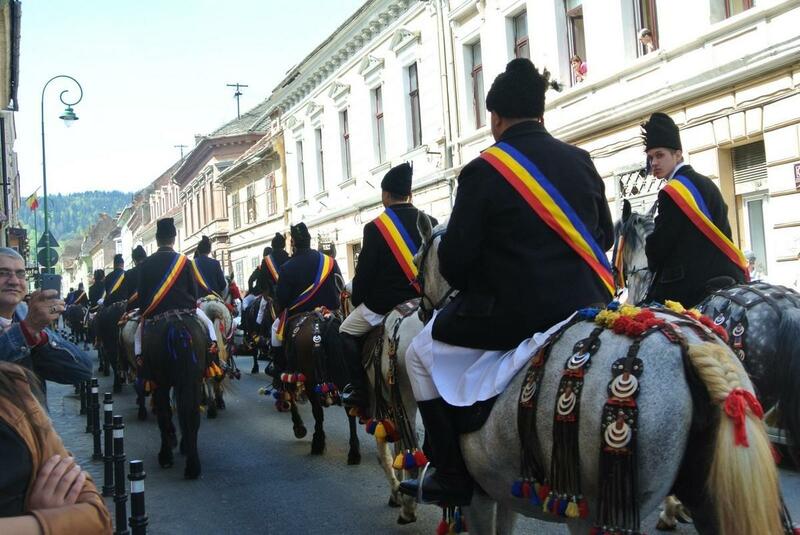 The pre-Christian rituals are still alive all across Romania and are often practiced alongside Christian holidays. 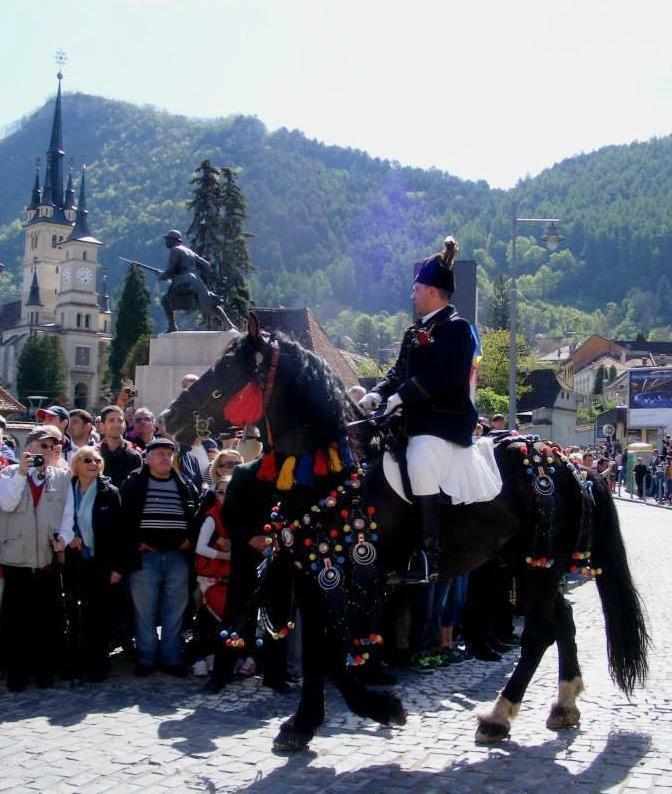 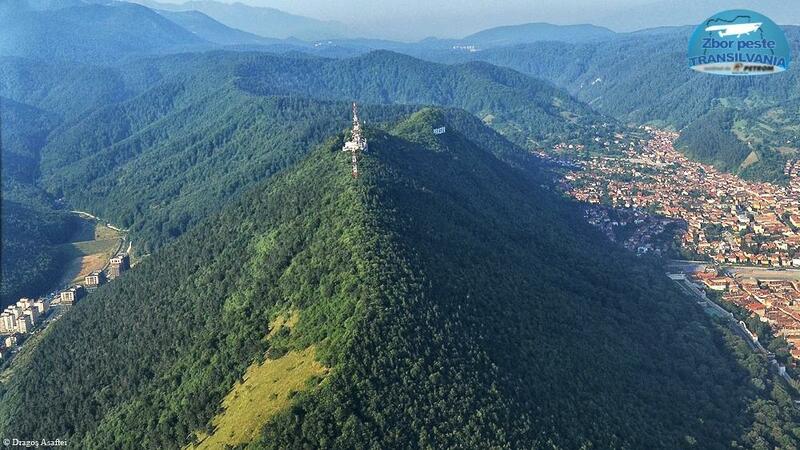 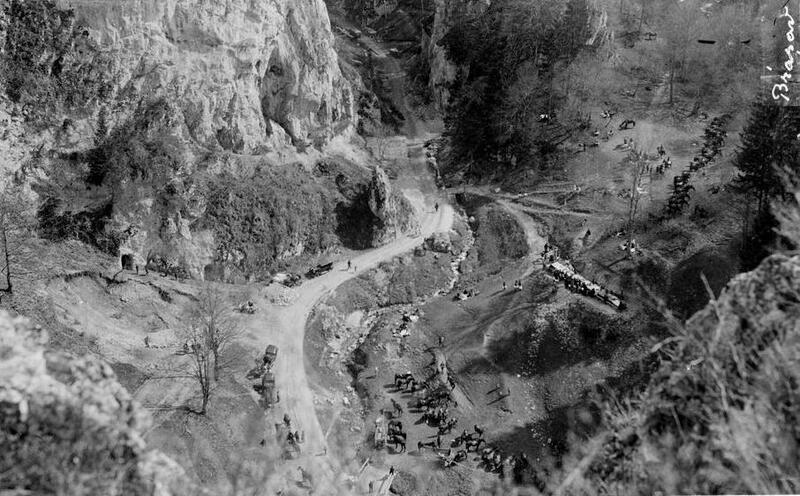 German chronicler Julius Teutsch, who observed the Brasov Juni rituals, concluded that they were remnant of an “ancient pre-Christian era” and said these traditions can be seen everywhere across the mountain hills since Dacian times. 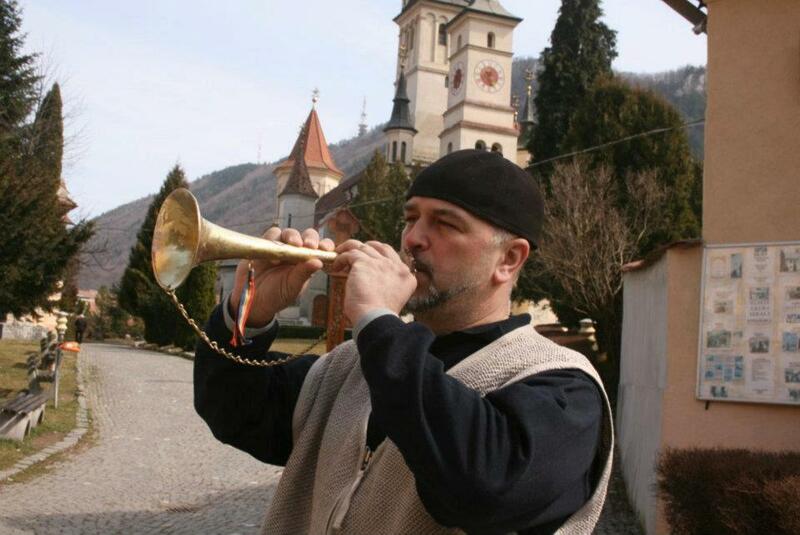 In Brasov, an old custom practiced by the Romanian community which is related to the ancient cult of the sun: on the day of Descent of the Holly Spirit (called Rusalii in Romanian) men, women and children of Schei left in the evening for Mount Postăvarul (a few km from the village) after men knocked from door to door, using a hammer designed as a serpent to knock on each gate. 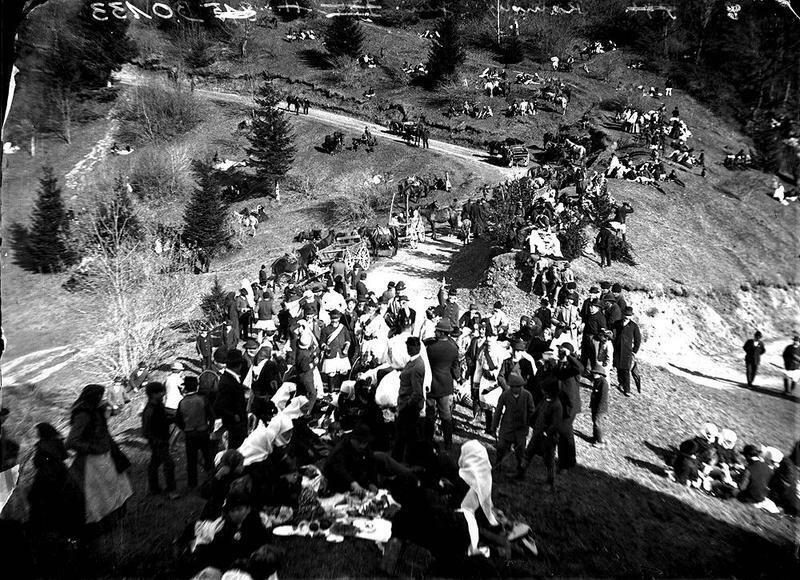 On the mountain they waited until morning when the sun appeared in order to throw what they had on hand towards the sun, lest the “werewolves” stole the sun. 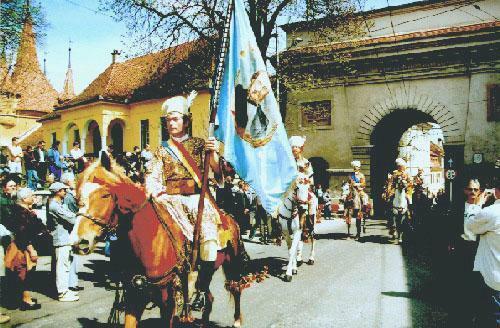 Dacians believed that the life-giving sun was swollen by dragons during winter; the same motif can be found in the Thracian Horseman depiction where a man on a horse fights off a dragon (in pre-Christian mythology, the horse is associated with sun and summer, and the wolf/ werewolf associated with winter). 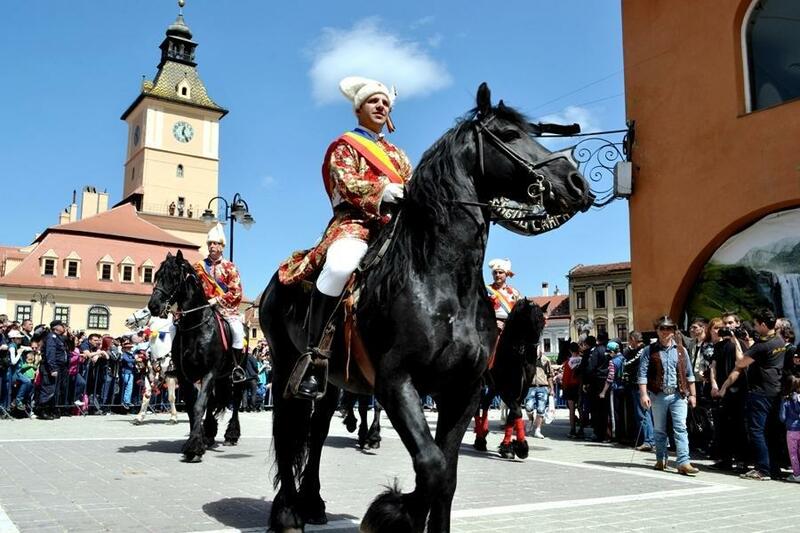 The presence of horses is not accidental; the animal always played a vital role in popular folk since time immemorial – the horse was believed to be pulling the Sun Chariot across the sky, bringing with it the life-giving sun and assuring fertility for the new year. 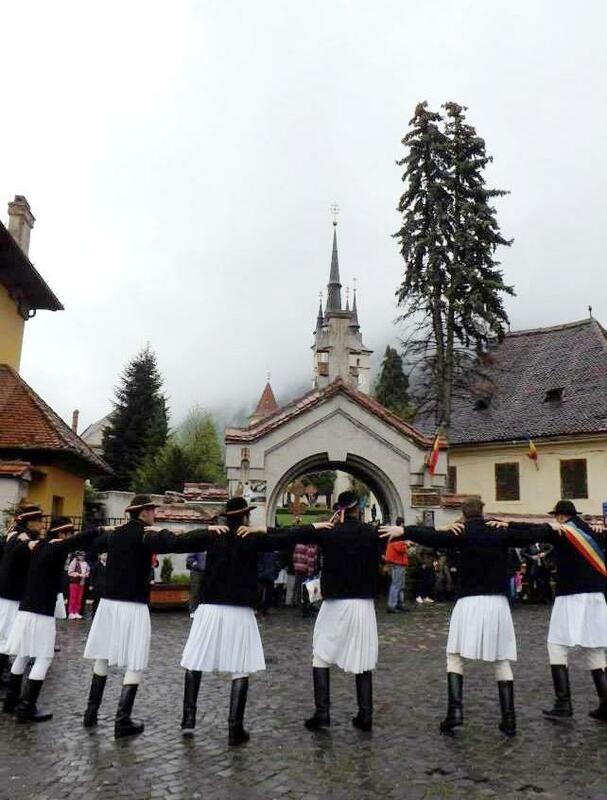 The Dacians celebrated this cult in the spring, when the Brasov Juni also celebrate it in order to mark the renewal of nature and the beginning of new life, whose significance was intertwined with the revival of Christ. 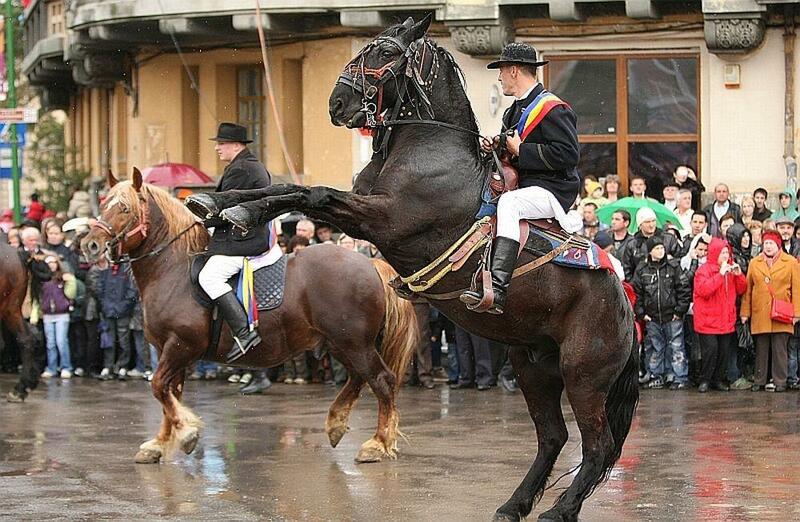 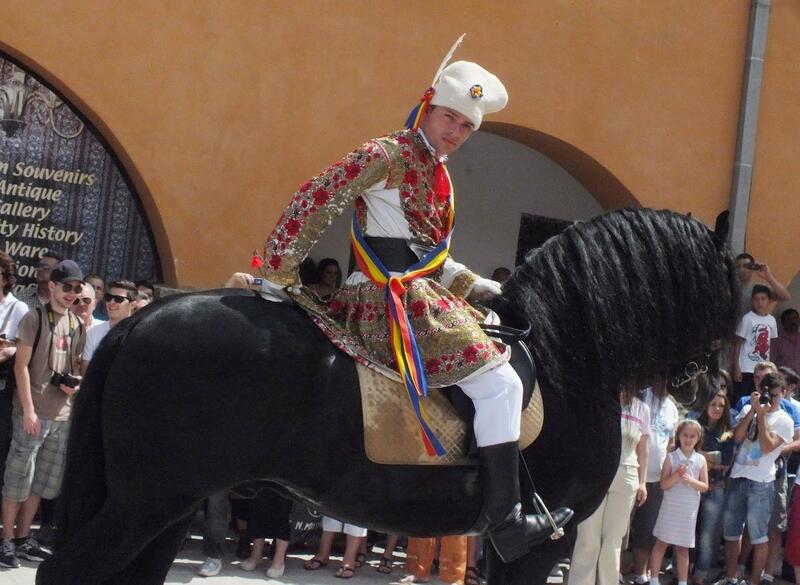 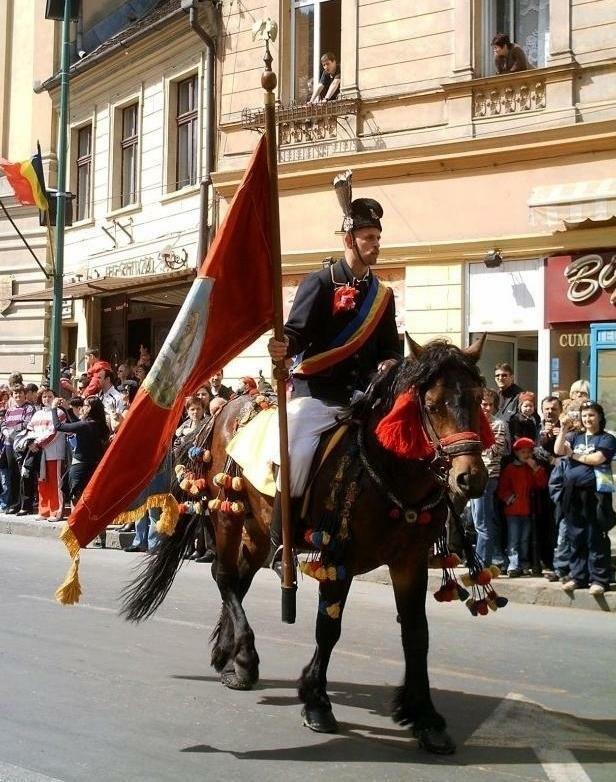 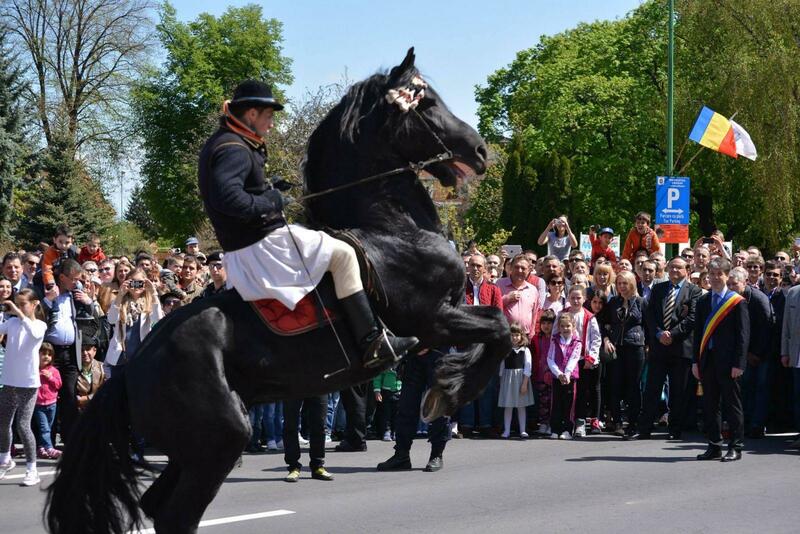 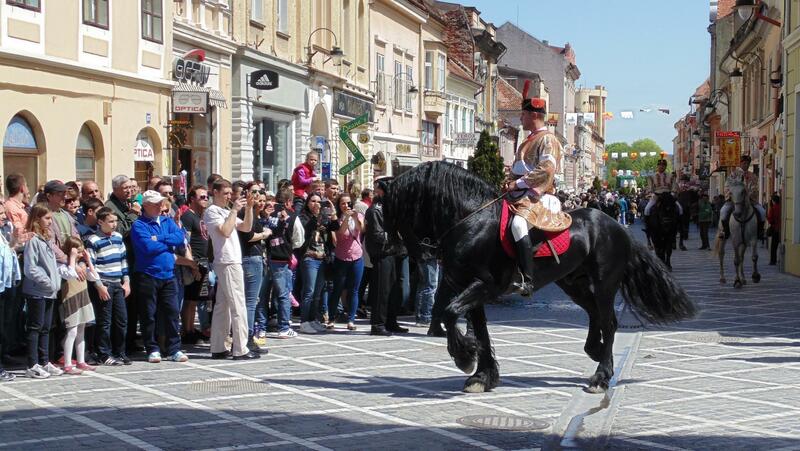 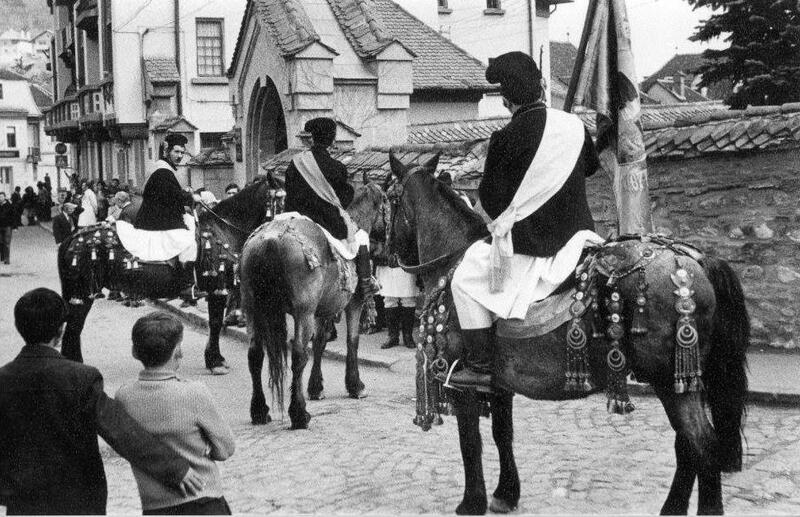 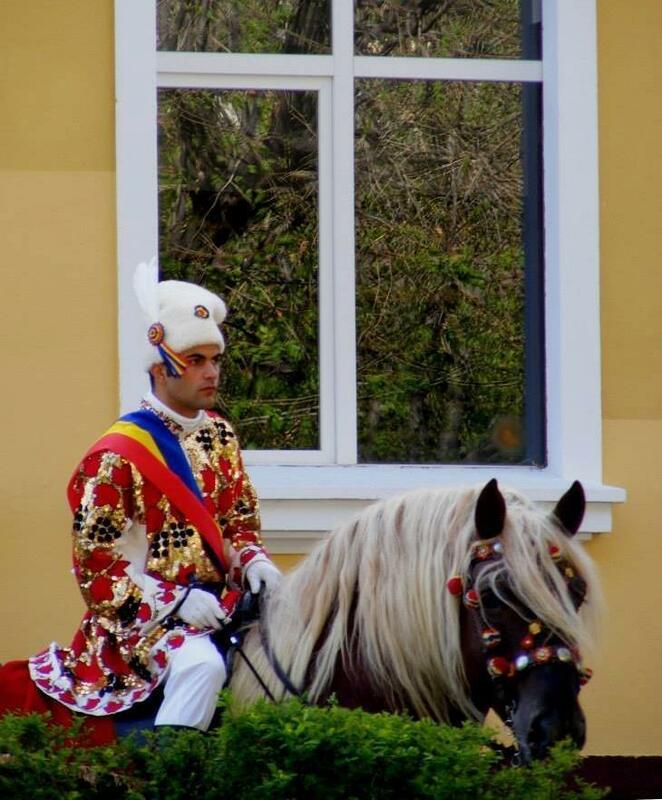 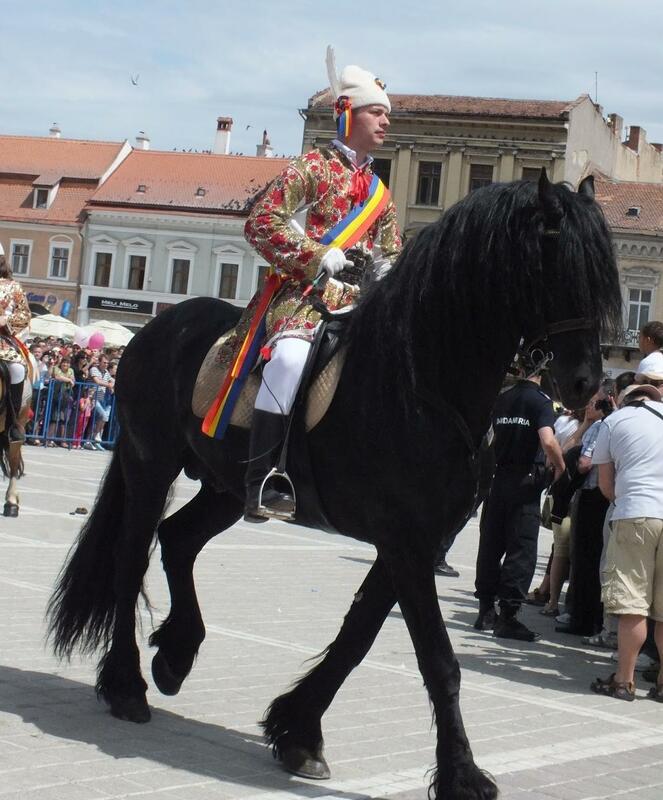 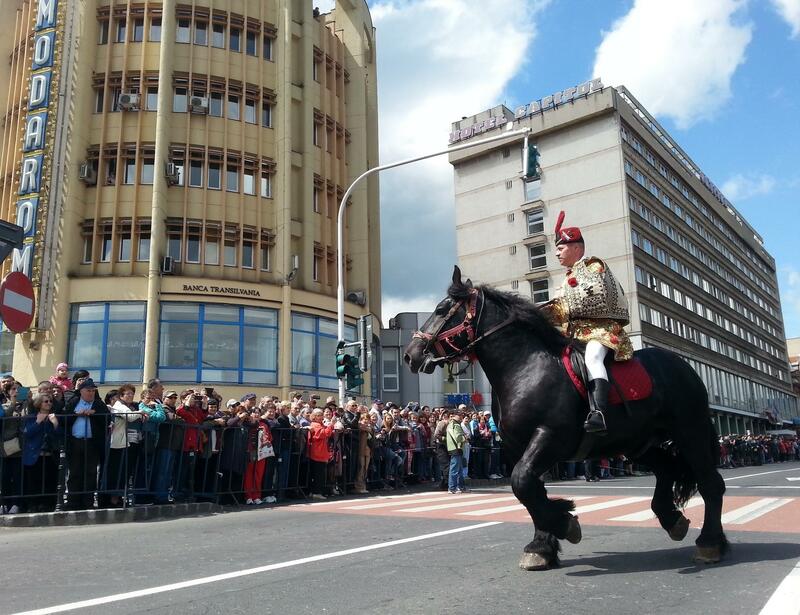 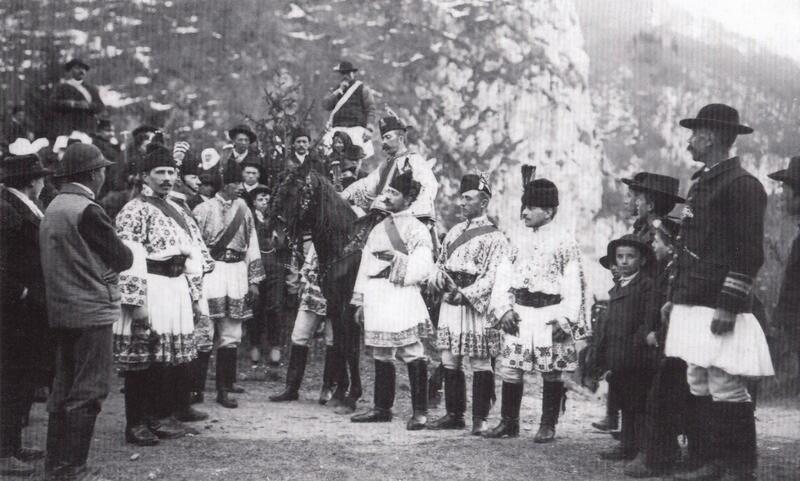 The horse is venerated in various ways across the country, such as Boboteaza Cailor (The christening of horses). 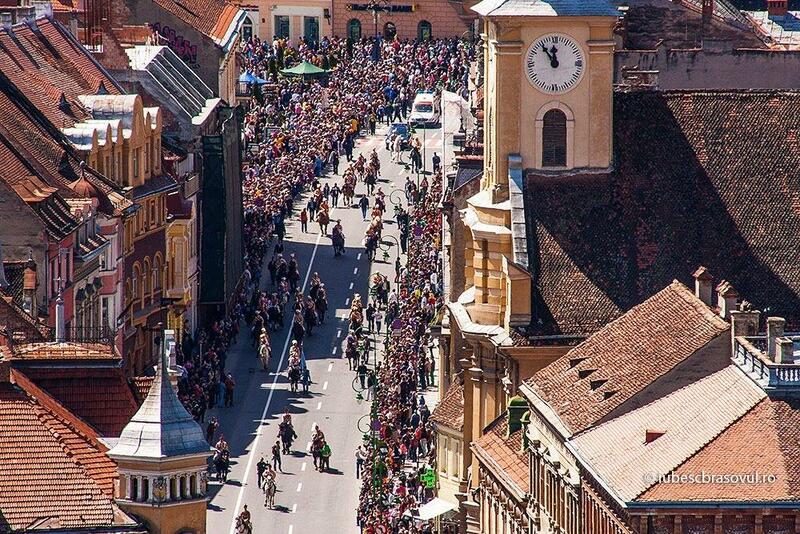 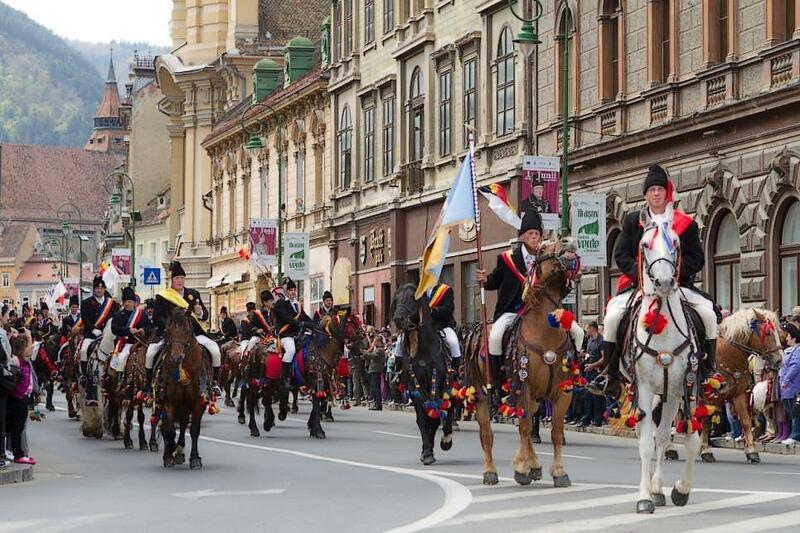 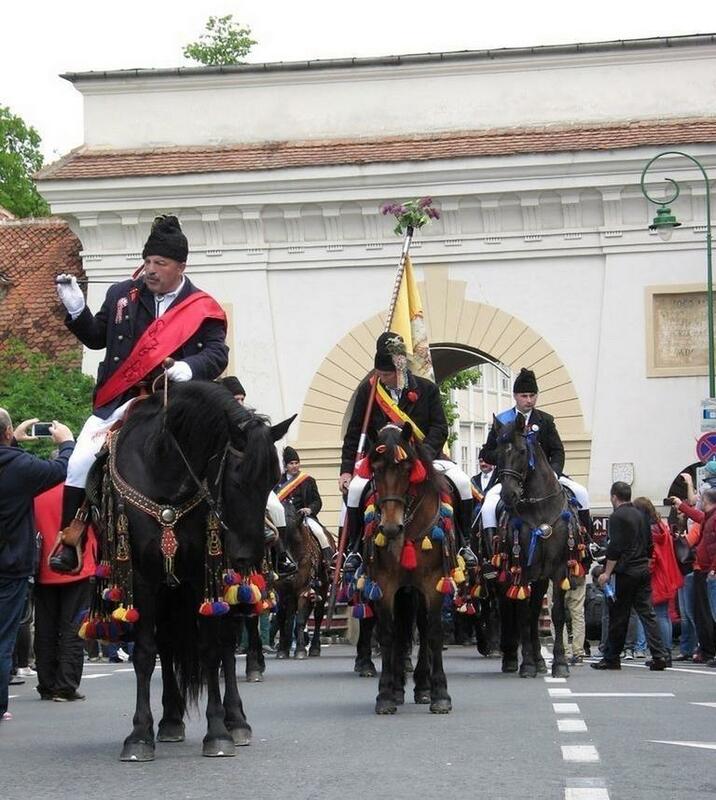 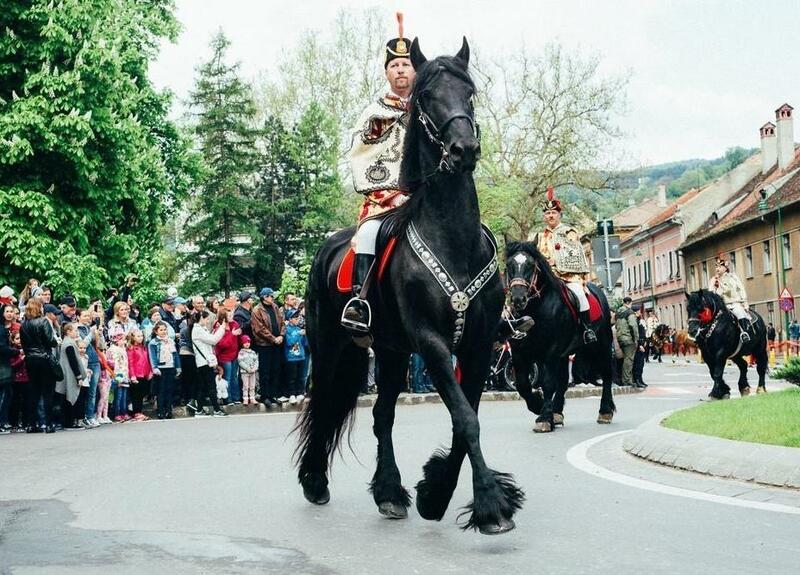 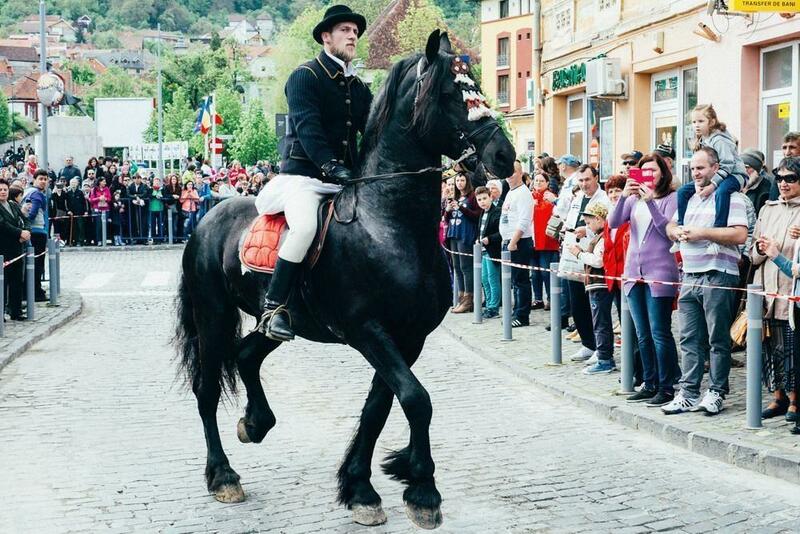 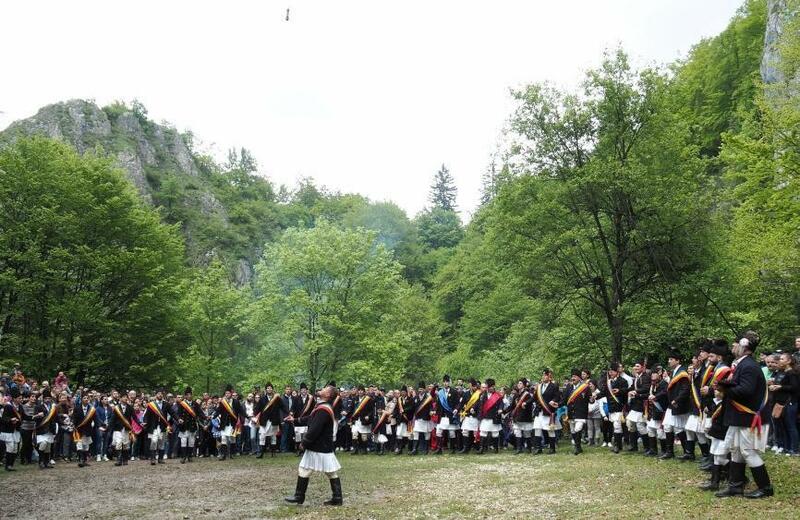 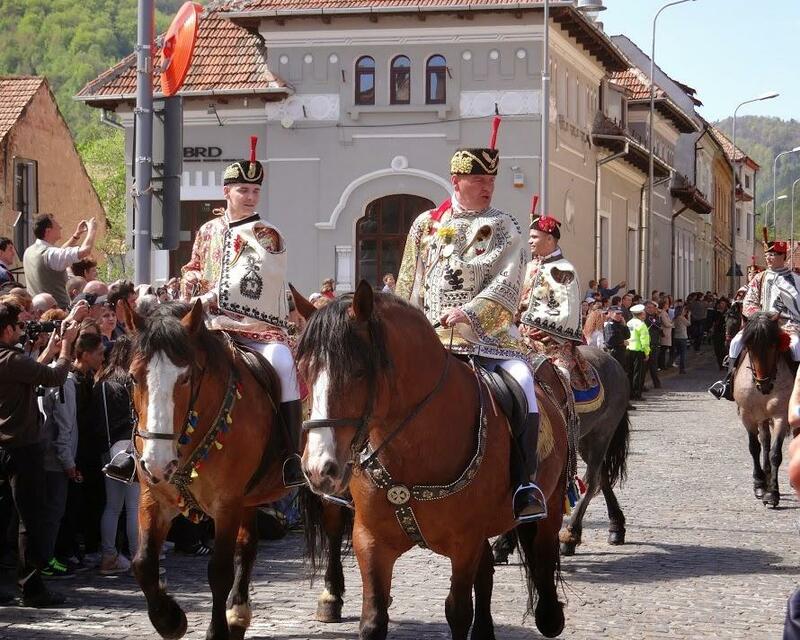 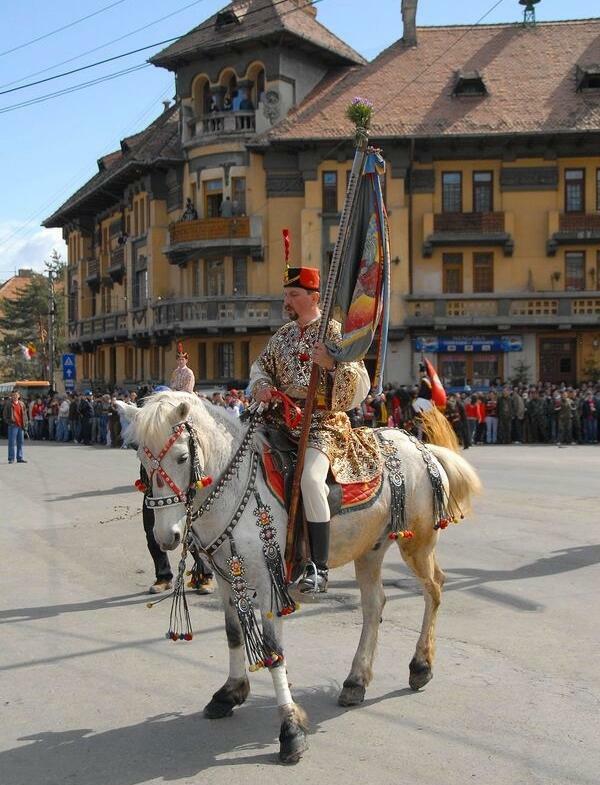 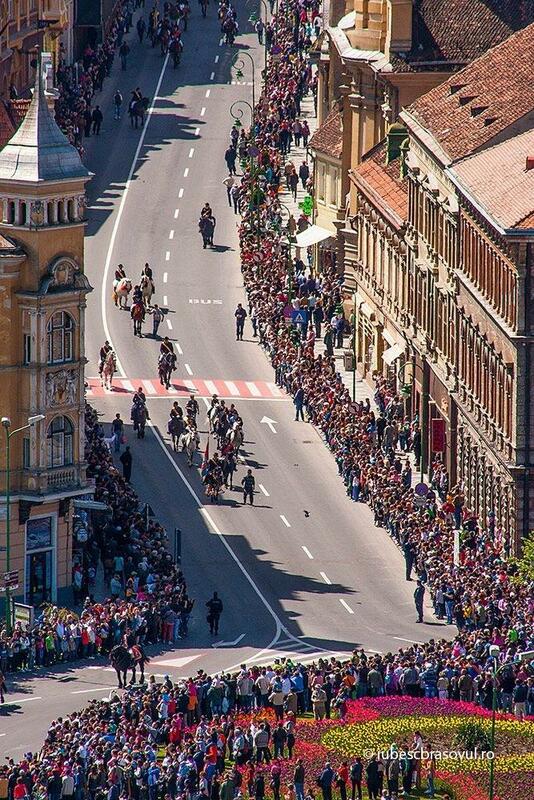 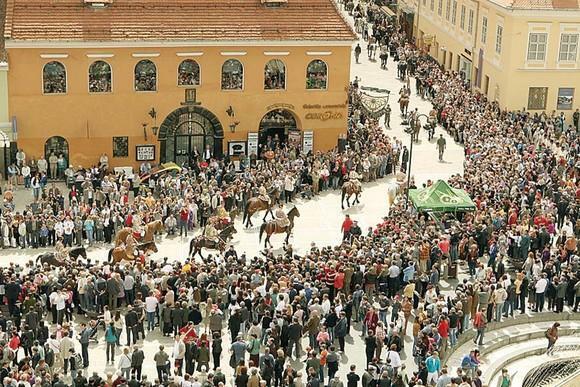 Although the meaning of “June” is “young unmarried son“, the Brasov ceremony reunites all men. 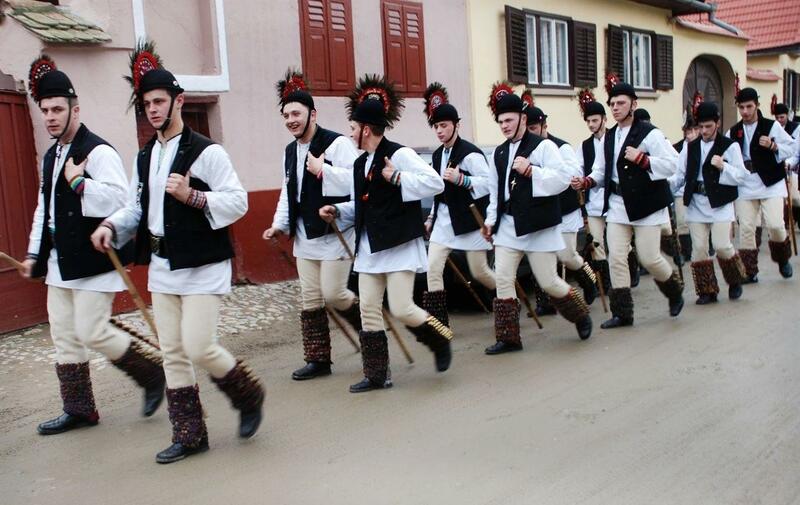 The young unmarried men are picked up from their family homes by organized groups of men of all ages, and for the following days they play out a series of rituals and traditions. 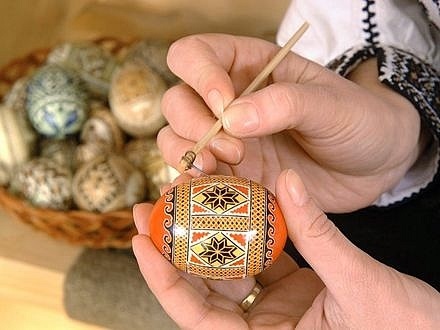 The ceremony begins Monday early morning and ends one week later on the first Sunday after the Orthodox Easter (Duminica Tomii). 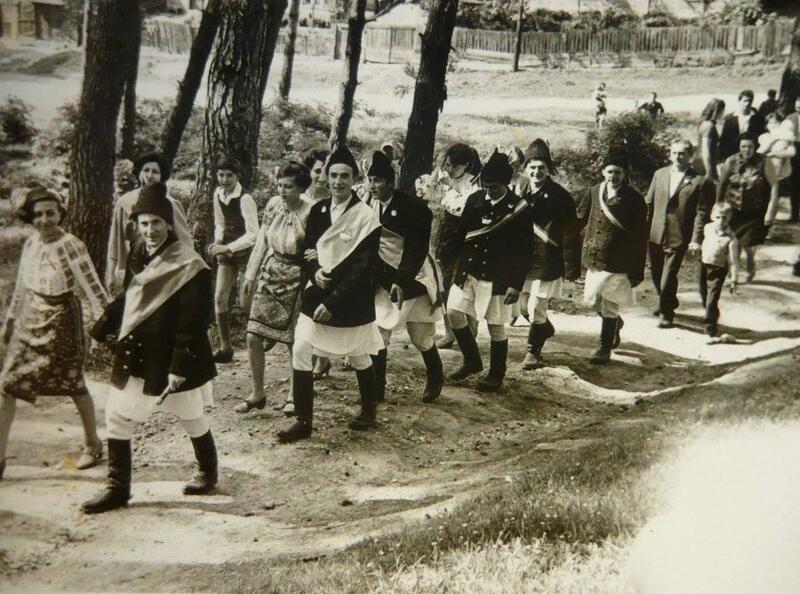 On day one, the young men visit the homes of young unmarried girls. 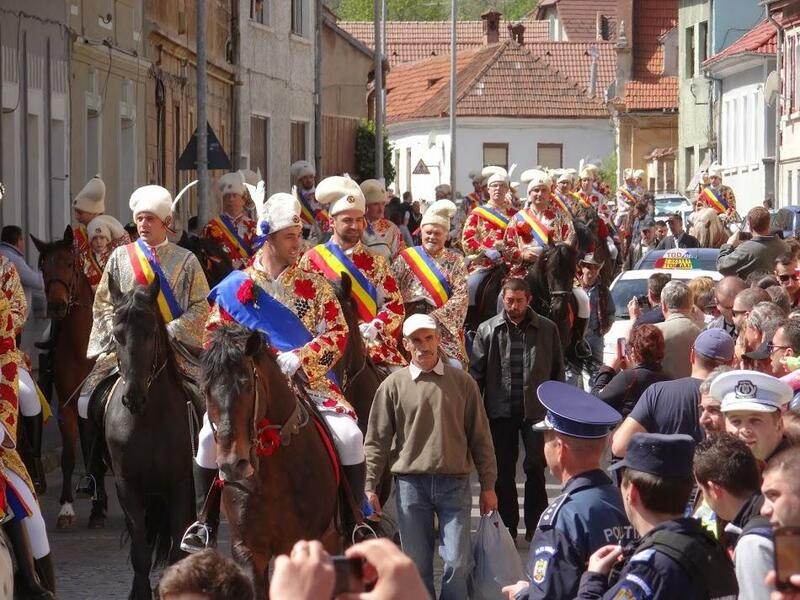 On the last day, they have the ceremonial walk on horseback through the city, which ends at Solomon’s Rocks, located 2 km from Schei. 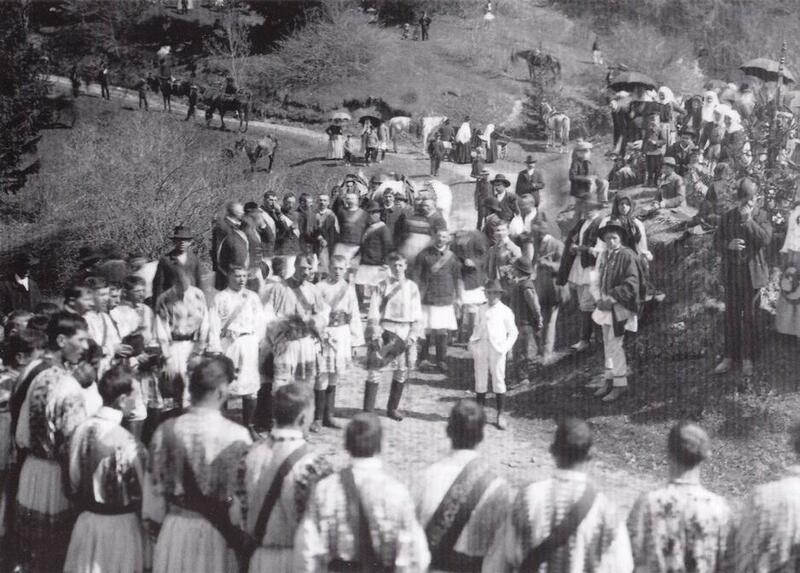 The men are divided in 7 traditional groups, number based on the religious belief that God made the world in 7 days. 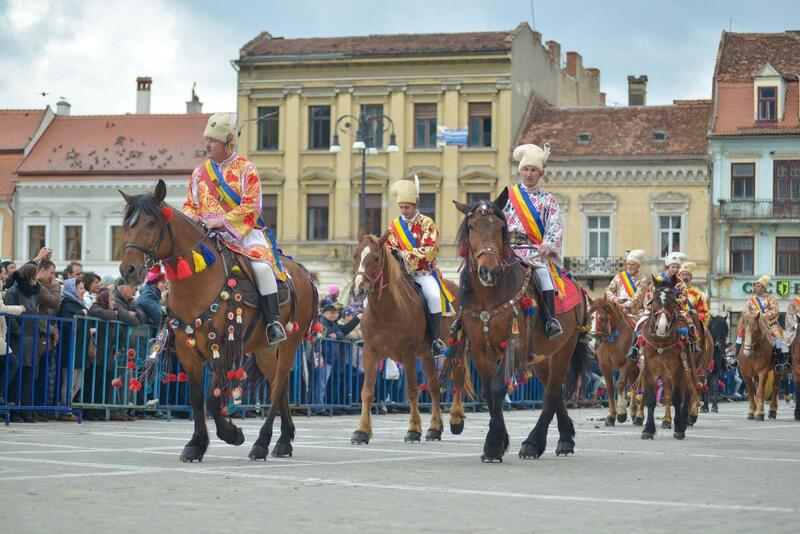 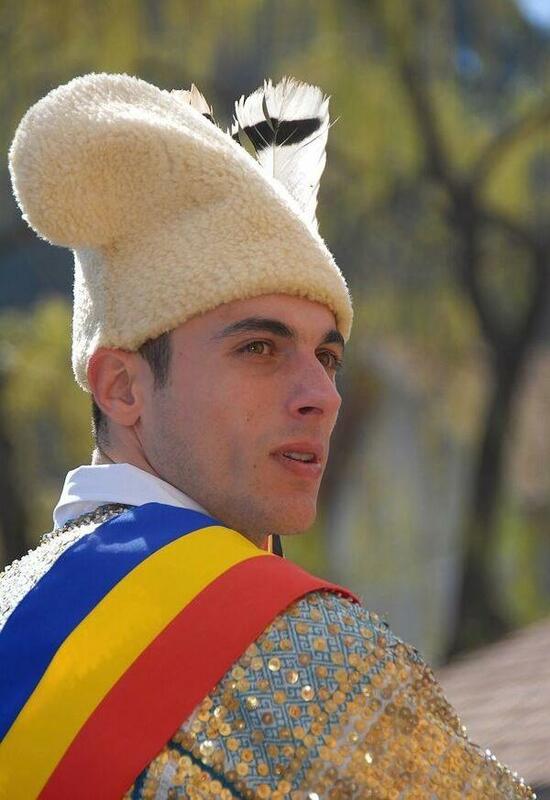 Every group has its own costumes and the leader of each group carries a scepter with a traditional flag and a tricolor ribbon (colors of the Romanian flag), which signify dignity and bravery. 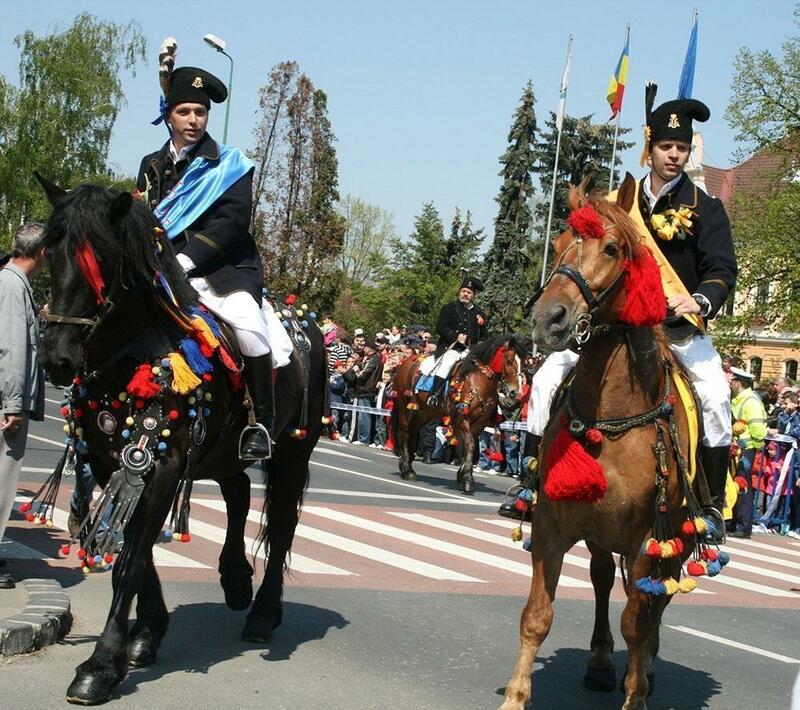 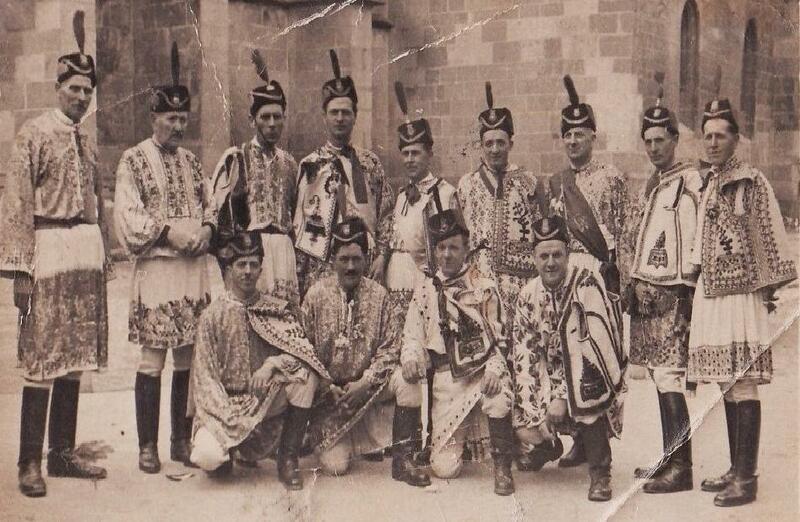 The leading group is wearing the traditional costume of Romanians (“Vallachians”) of Brasov. 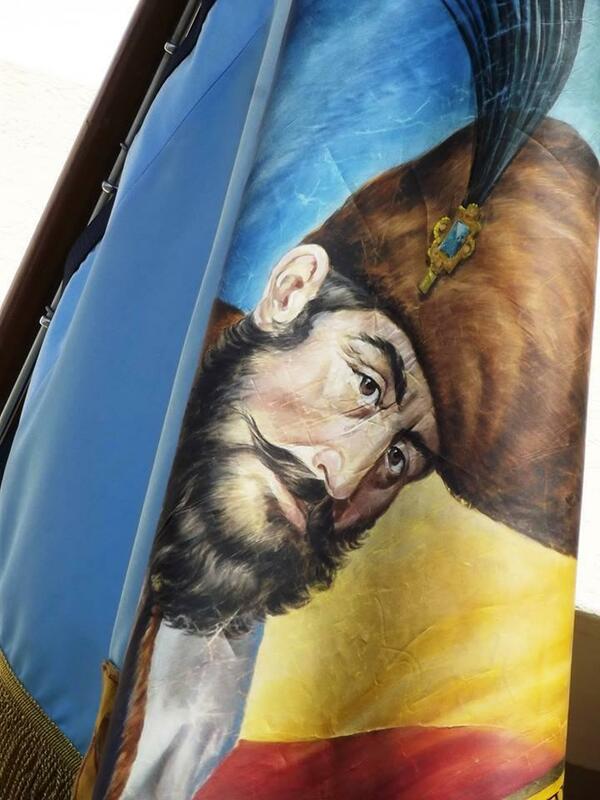 Their hat is tailored after the model of Michael the Brave’s hat (Vallachian prince who first united the 3 principalities in 1600) and is worn by 4 of the 7 groups of men. 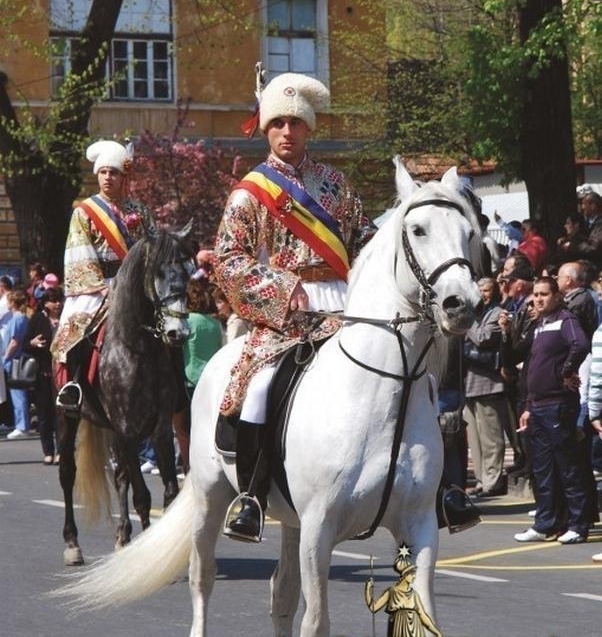 The hat is tailored after the model of Vallachian prince Michael the Brave’s hat and is worn by 4 of the 7 groups of men. 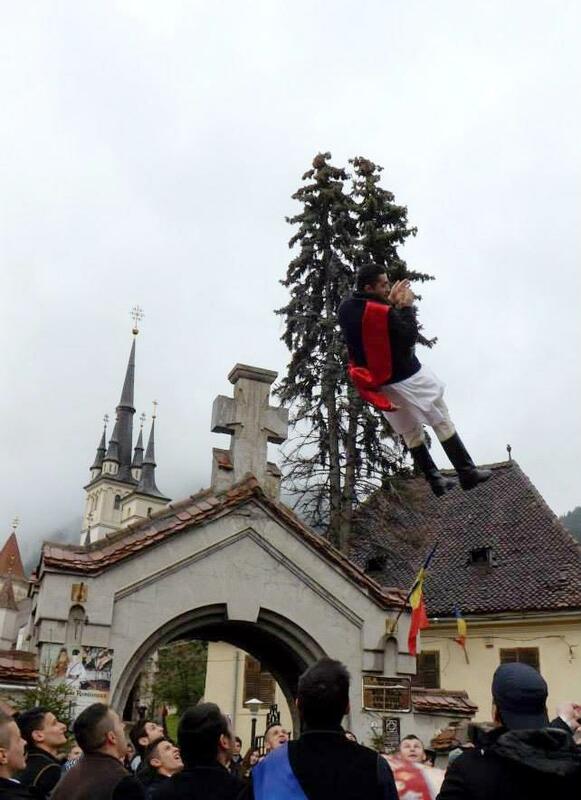 One of the Juni rituals, which takes place on Thursday, includes “aruncatul in țol” where the young men are thrown in the air 3 times. 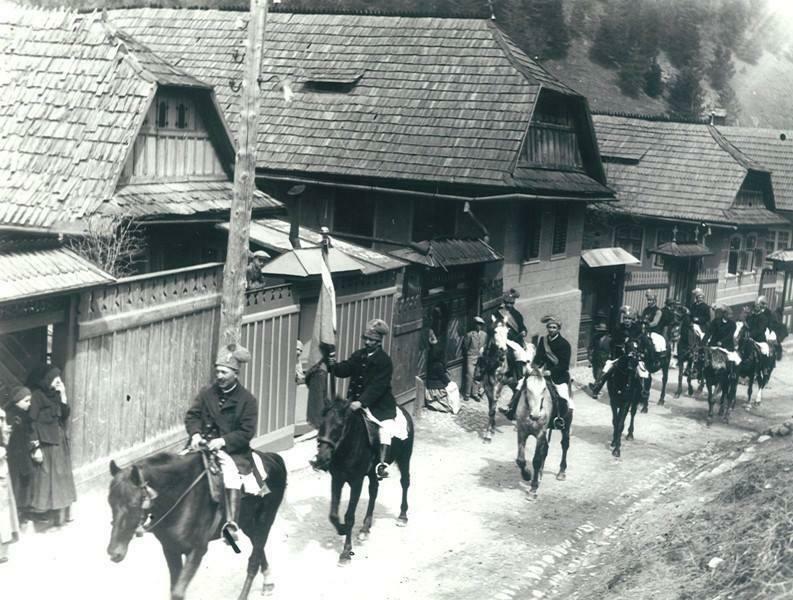 On the last day, the Juni have the ceremonial walk on horseback through the city which ends at Solomon’s Rocks, located 2 km from Schei. 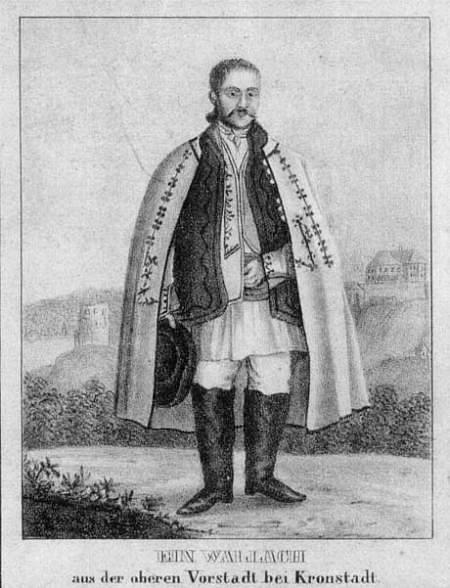 In 1842, Georg Gottlieb Schnell published a series of costume litographies that included the Romanians of Schei, Brasov. 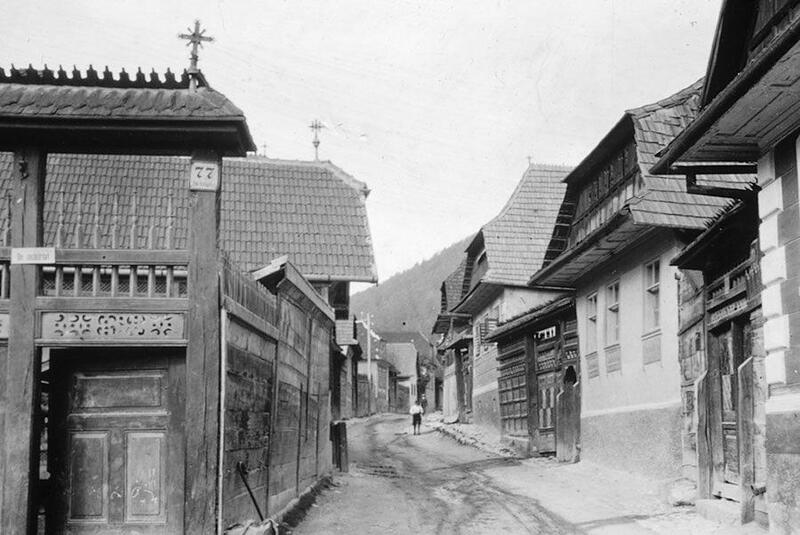 Referred to as Vallachians at the time – “Vallachian from the neighborhood of Brasov” – the neighborhood being Schei, located outside the city walls at the time. 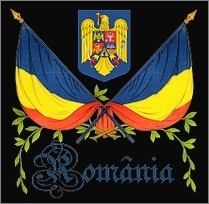 Romanians were refereed to as Vallachians (Wallach) by Saxons and other foreigners (“Wallach” was a Germanic word used by foreigners to define Latin speaking populations of Eastern Europe – found in Vallachia, Moldavia, Transylvania). 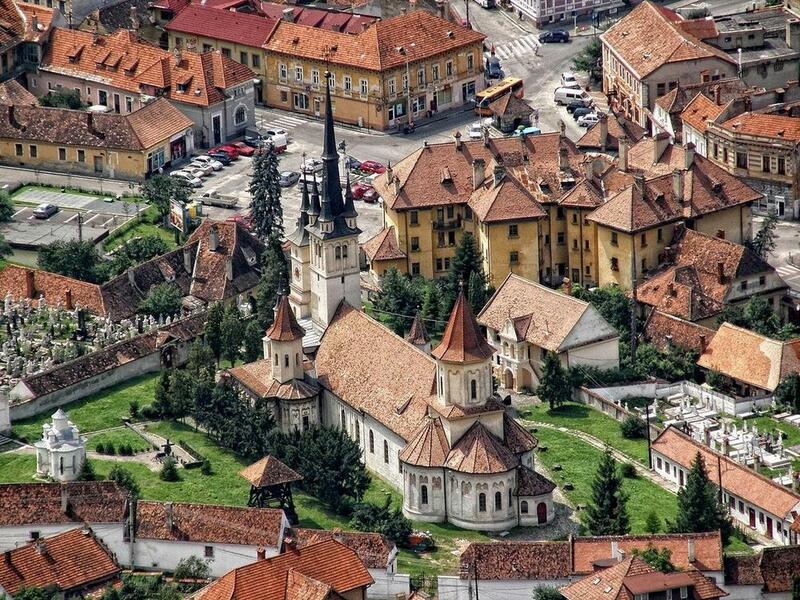 Antonio Possevino described the main commercial settlements of Transylvania in his 1584 manuscript “Transilvania”: when mentioning Brasov (called Corona in latin), he mentions the main fortified citadel inhabited by Saxon merchants, surrounded by 3 suburbs with Hungarians, Romanians and Saxon farmers. 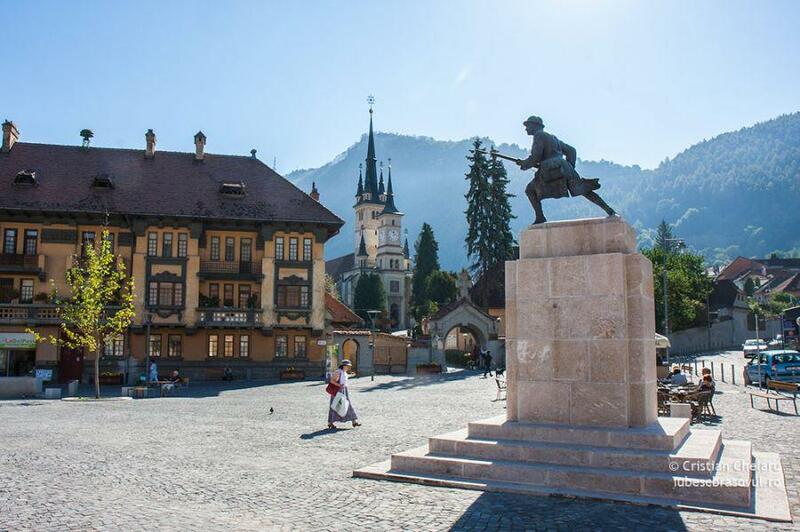 He calls Brasov small but flourishing due to its strategic location, with commercial ties with just about everyone. 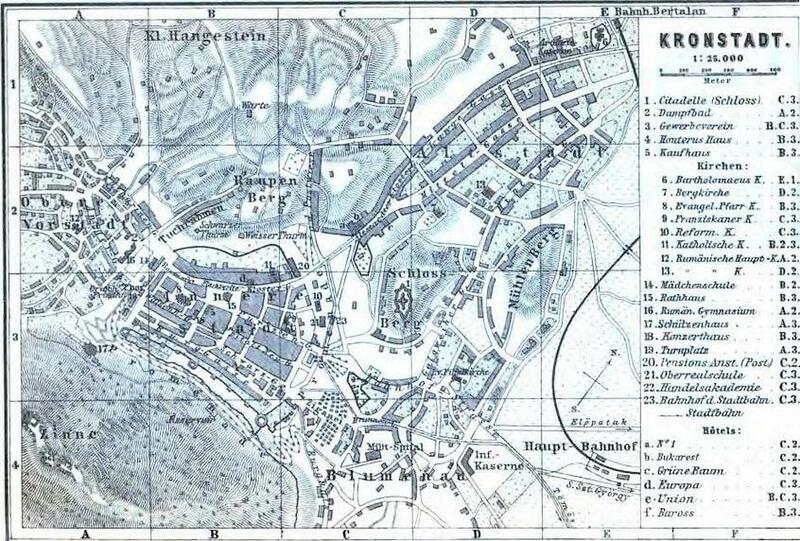 Ludwig Binder’s book “Johannes Hunterus. 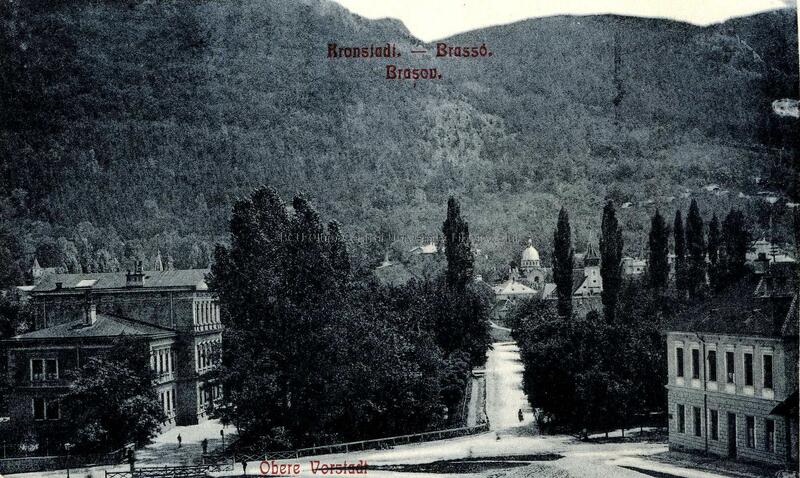 Schriften, Briefe, Zeugnisse” (chapter 16) contains a medieval century letter from Johannes Honter (Saxon humanist who lived and died in Brasov) who described Brasov and three main communities living near it: Romanians in Schei, Hungarians, Saxon farmers (the inner fortress allowed only Saxon merchants and the upper class). 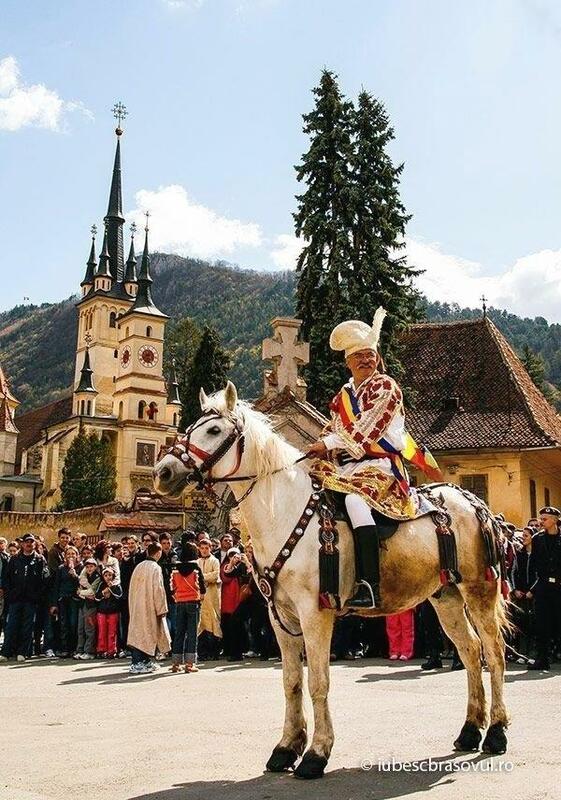 In the book “Das Alt und Neu Teutsche Dacia” published in 1666, Saxon historian Johannes Tröster described the Romanians (Rumunyi) of then-Transylvania as an oppressed people with no rights, whose settlements are located in the mountains or near Hungarian/ Saxon towns. 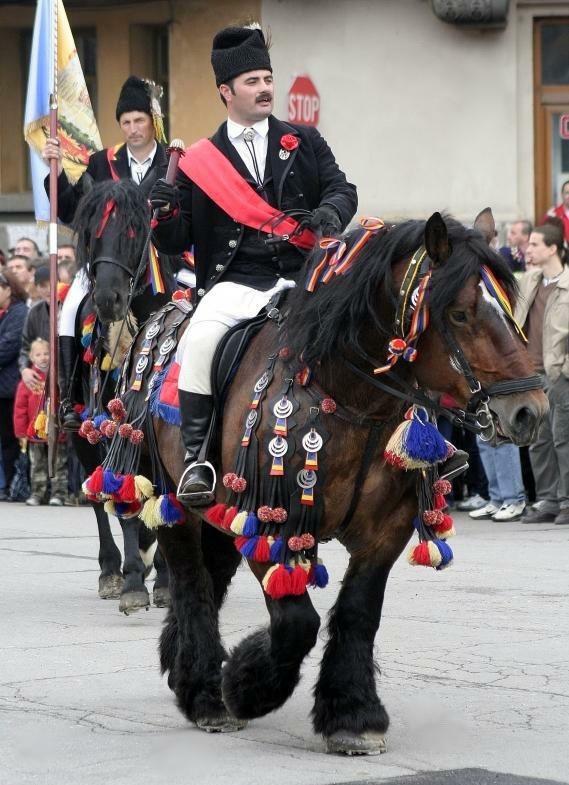 He acknowledged the surprising latinity of these “simple uneducated peasants”. 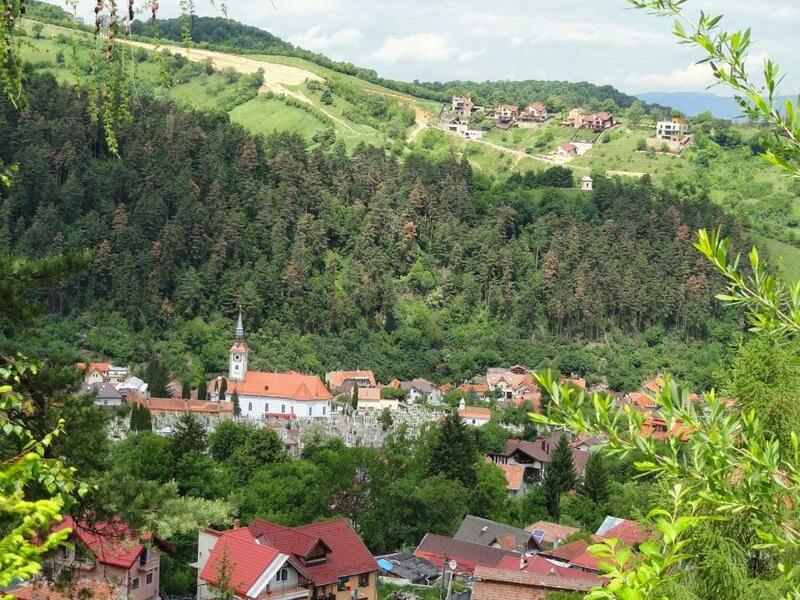 He went on to transcribe from hearing a few Vallachian phrases in order to prove the latin substratum, phrases which are perfectly intelligible with modern Romanian. 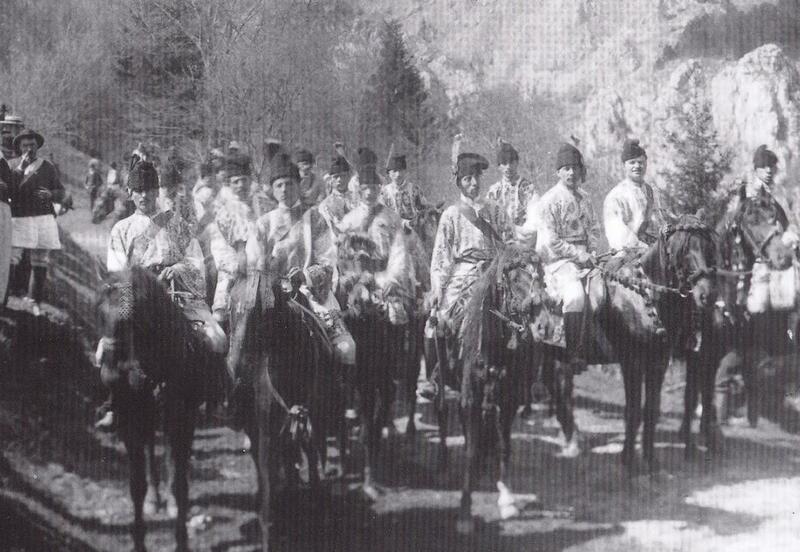 He also described their religion as identical to that of “Russians and Moscovites” (Christian-Orthodox). 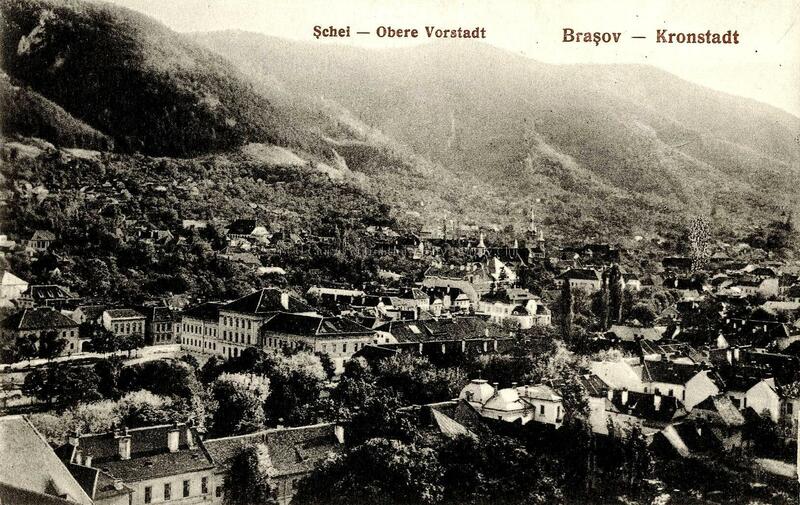 The old Brasov was divided into Kronstandt or Corona (the main citadel) and 3 neighboring suburbs: Altstadt (Brasovechi in Romanian) inhabited by Saxons, Bulemnau (Blumana in Romanian) inhabited by Hungarians, and Schei (the Vallachian Upper Suburb – Wallachische or Obere Vorstadt). 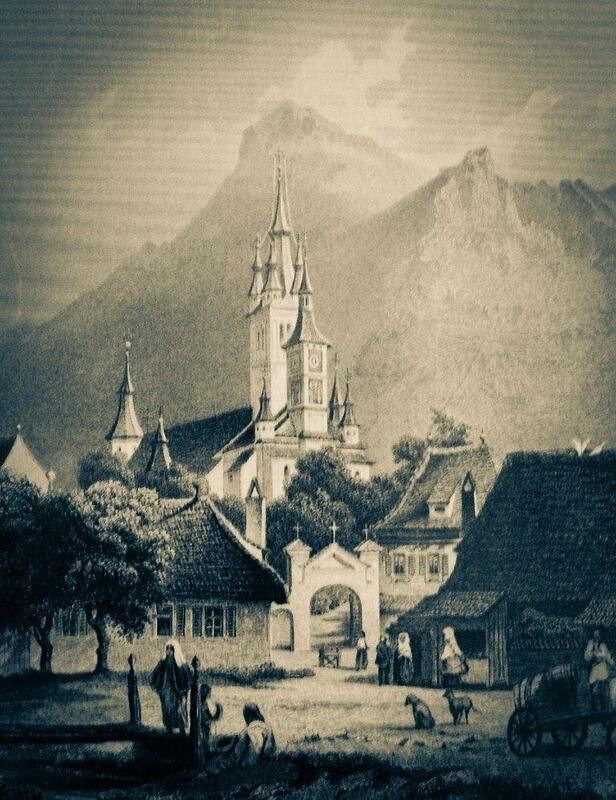 After the Saxons and Hungarians were converted from Catholic to Lutheran church, the Evangelical Blumenau Church was built on the place of a Catholic church to serve them. 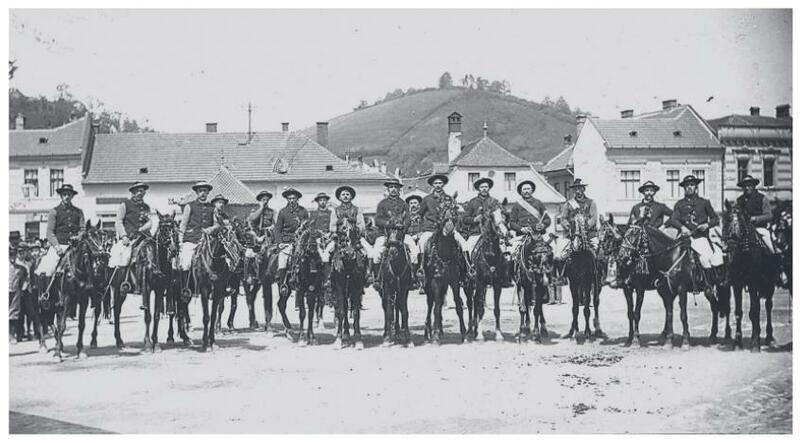 Sf. 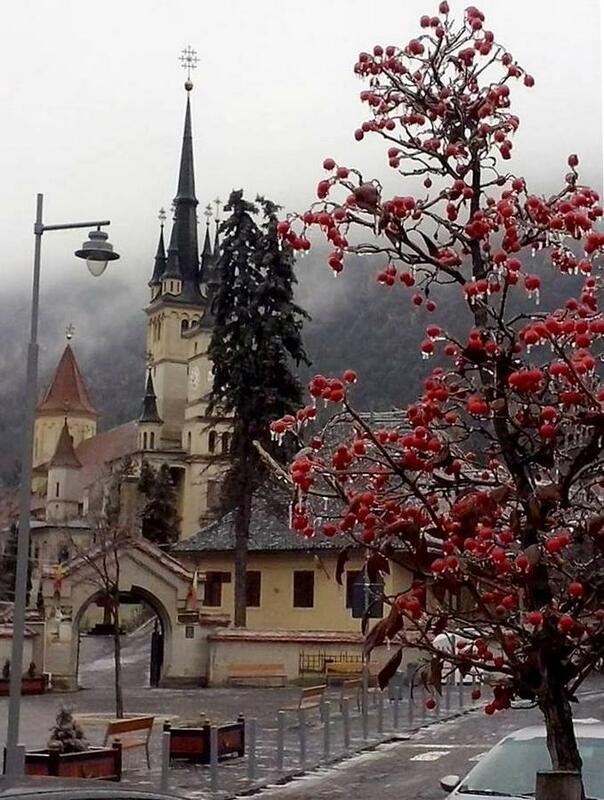 Nicolae orthodox church in Schei, first dated in 1292. 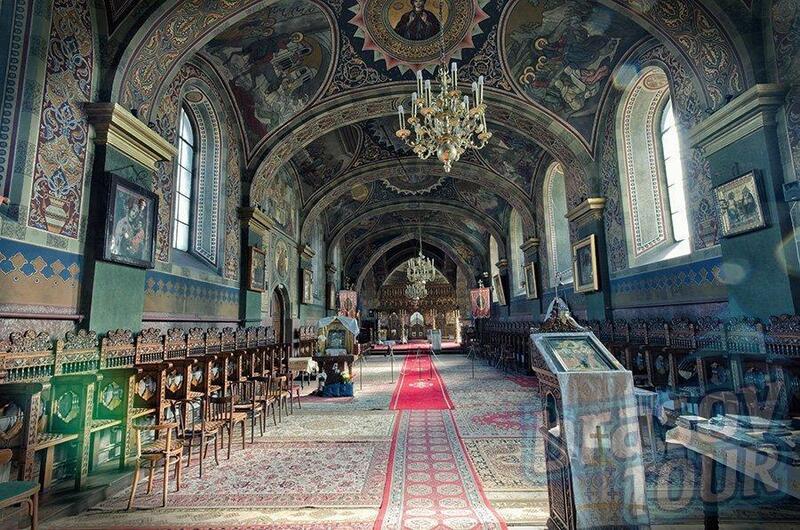 The Christian Orthodox church Sf. 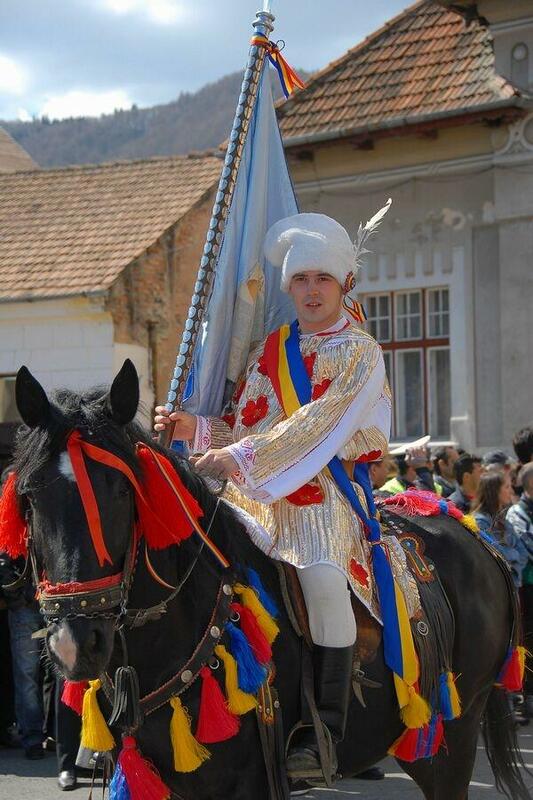 Nicolae (St. Nicholas) from Schei served the Romanian community for centuries. 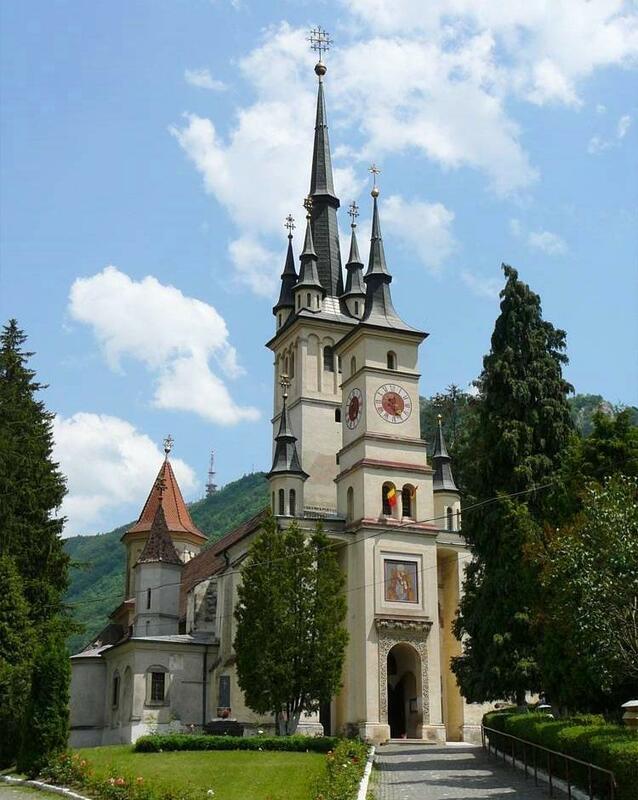 First dated as a church settlement in 1292, its one of the oldest Orthodox churches in Transylvania. 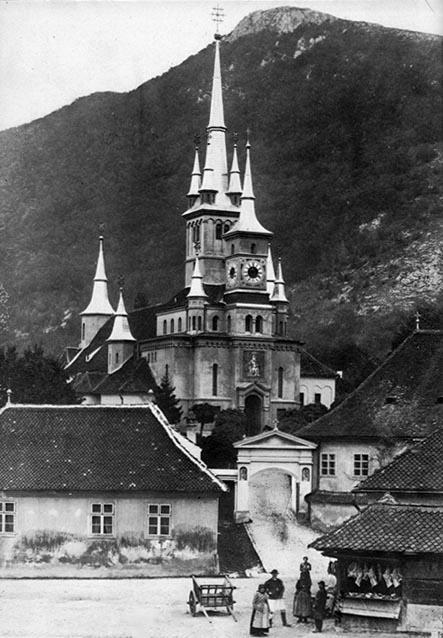 The first stone church was built in 1495 by then-prince of Vallachia. 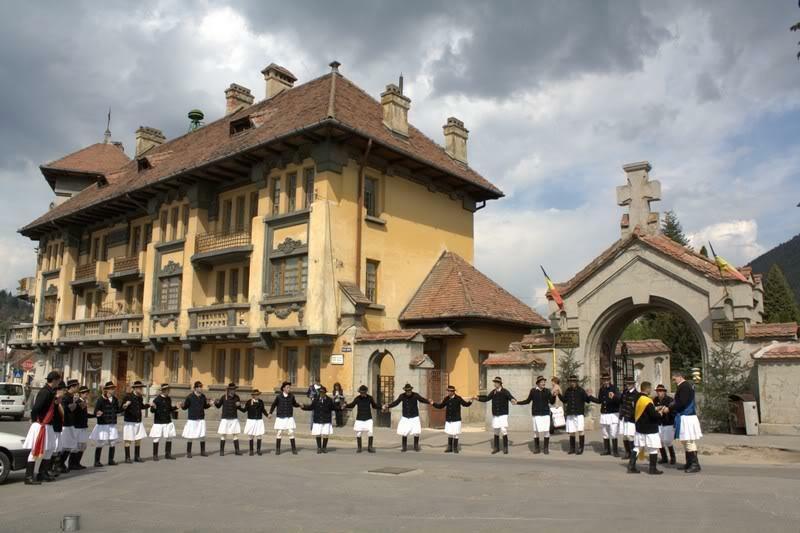 From 1556 the first Romanian books were printed here. 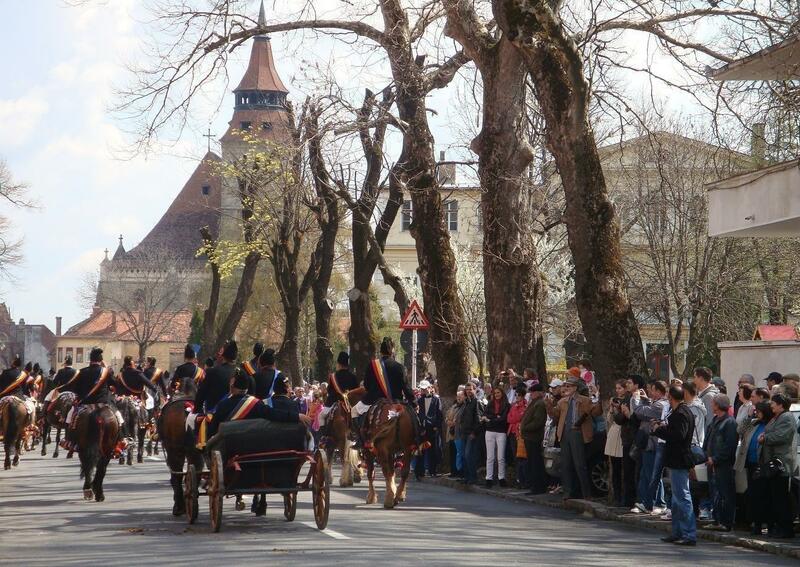 Next to the church is the first Romanian school, started in 1583. 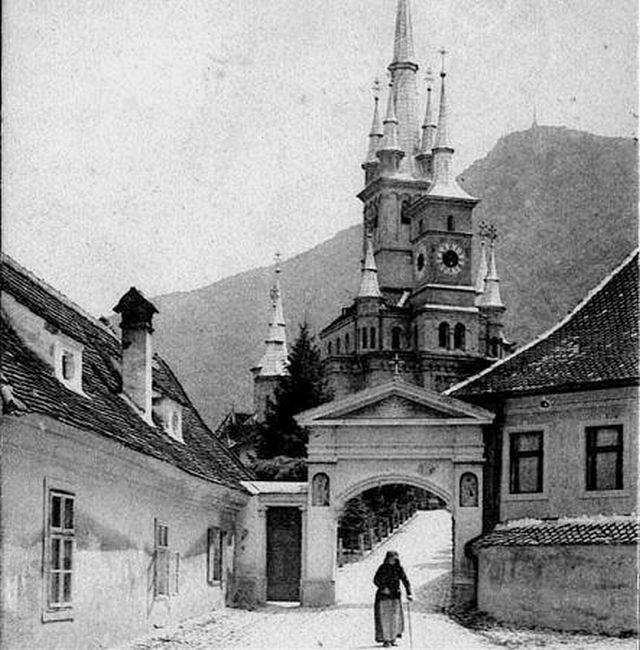 The Romanians from Schei could only enter Brasov citadel at certain hours and had to pay a toll at the gate for selling their produce inside the citadel; they entered on horseback through Ecaterina Gate (closed in 1820), also called Porta Vallace or Vallah’s Gate, as it was the only entrance for the “Vallachians”. 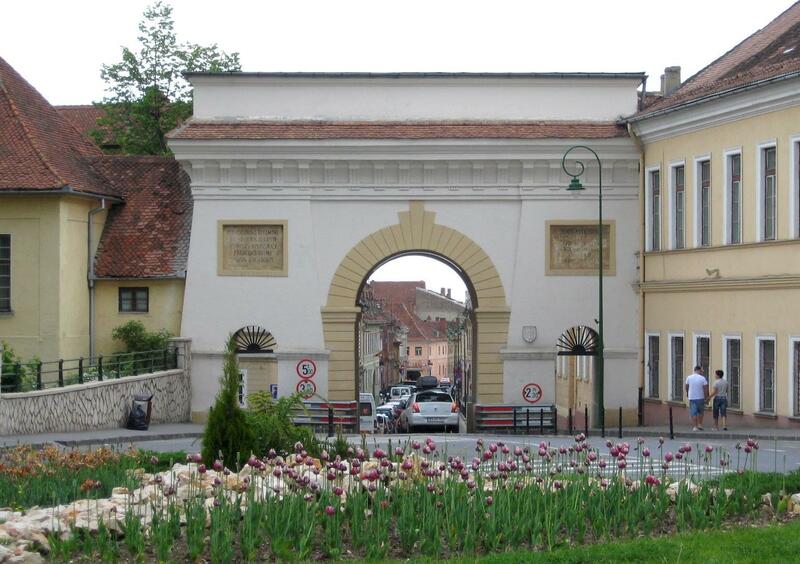 Another gate was built for them in 1820, called Poarta Târgul Cailor (Horse Fair Gate). 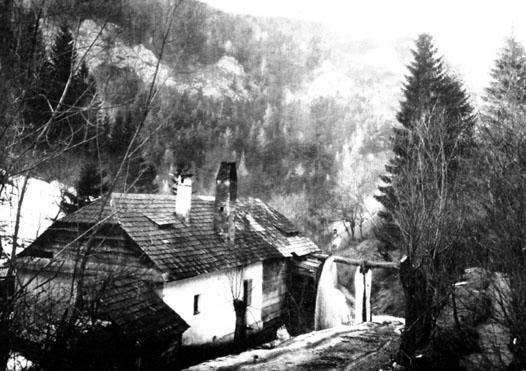 Still too small, the larger Schei Gate (Poarta Schei) was built in 1827 to fit the growing needs of the Schei population. 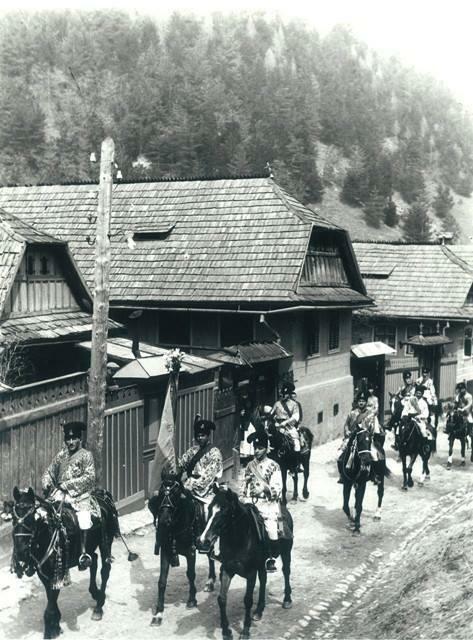 Schei Gate is still being used by Juni during their ceremonial walk when they come down from Schei towards the main city. 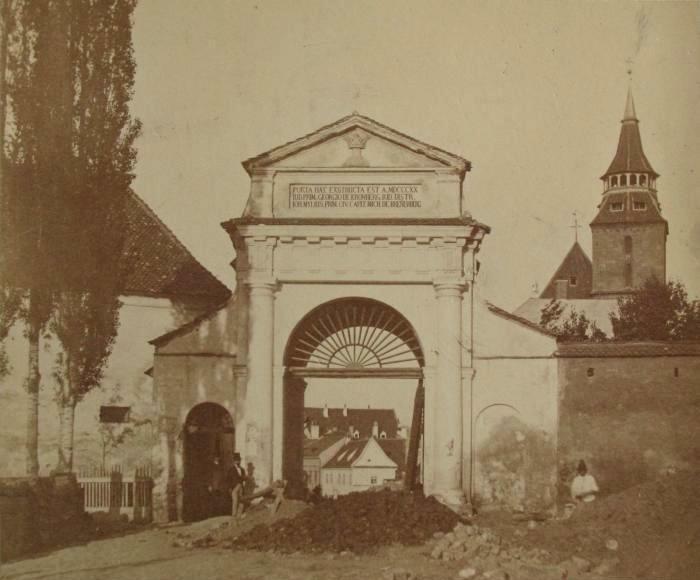 Ecaterina gate, the first gate used by Schei people to enter the citadel. 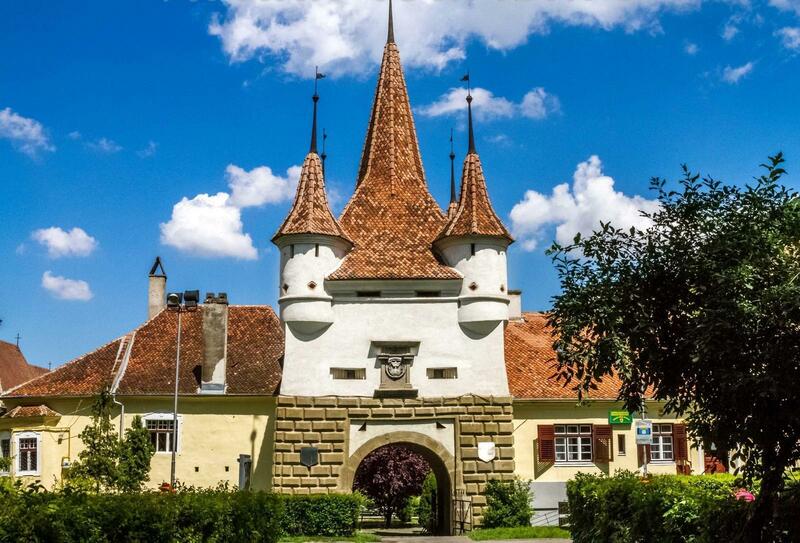 A bigger gate was built but still too small, it was replaced by a third gate simply called Schei Gate. 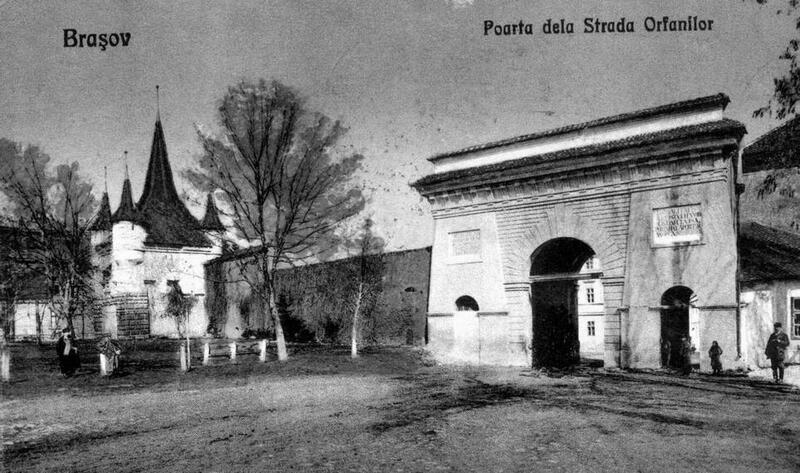 Poarta Târgul Cailor (Horse Fair Gate), the second gate built for Schei people. 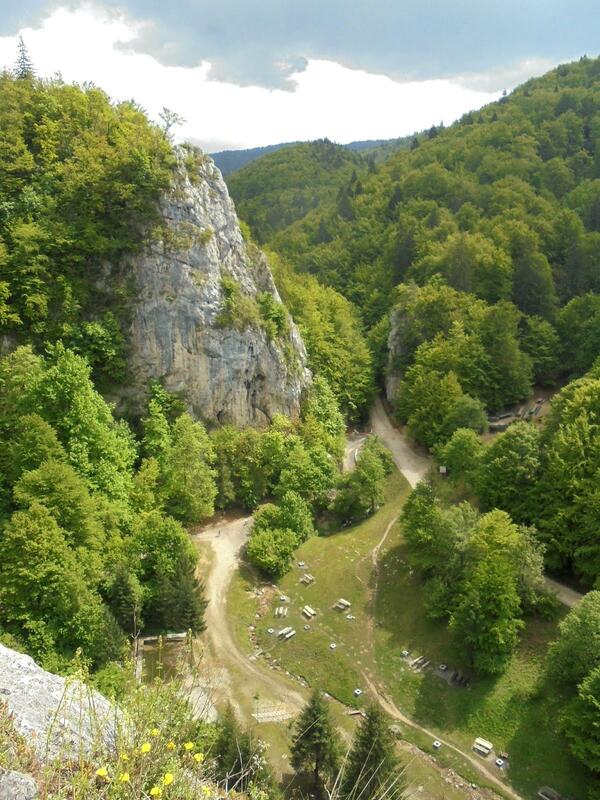 Dismantled a few years later. 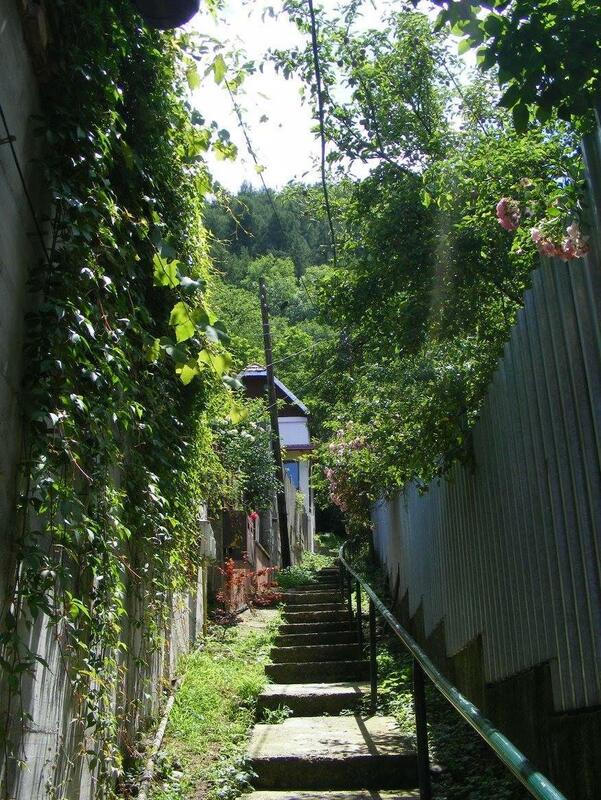 Schei Gate and Ecaterina Gate, the later less visible today from this angle due to the trees. 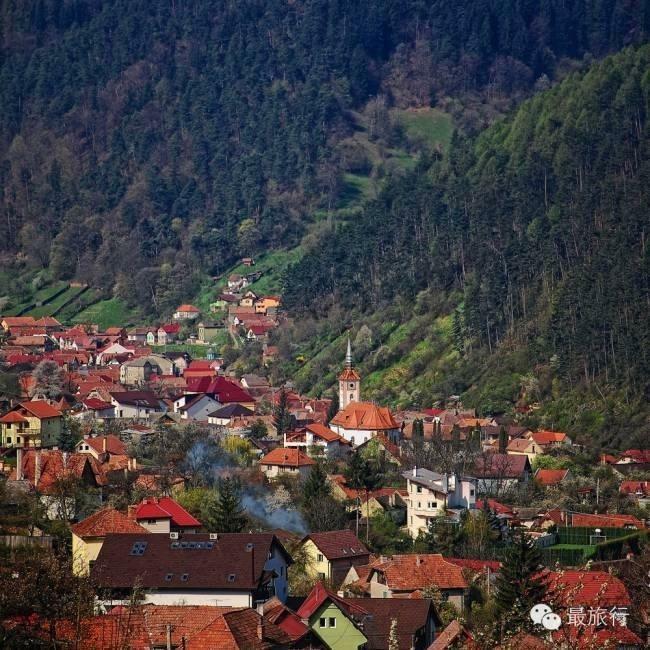 Schei village is located in a long deep mountain valley, crossed by multiple rivers and creeks. 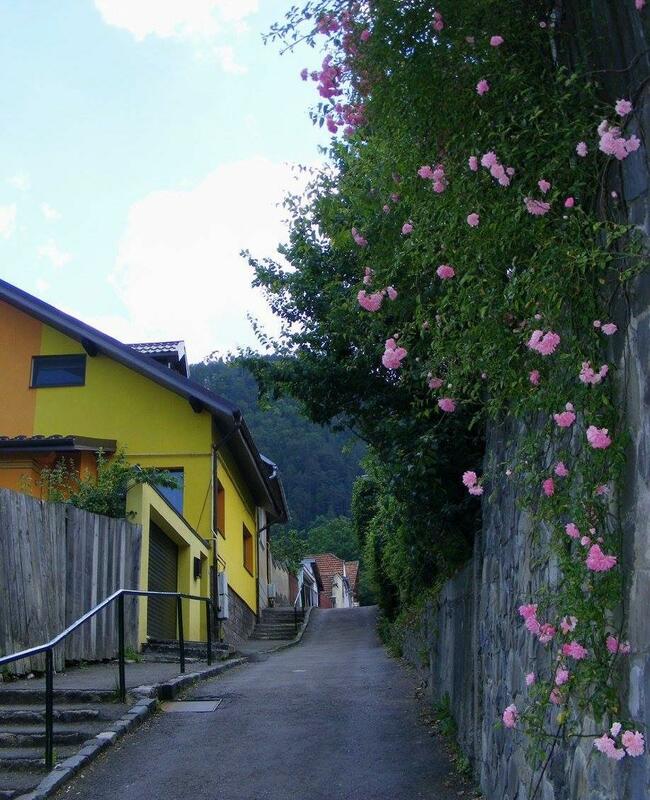 Because of this, the village numbered over 20 water mills in the XIX century which spread all the way to Solomon’s Rocks. 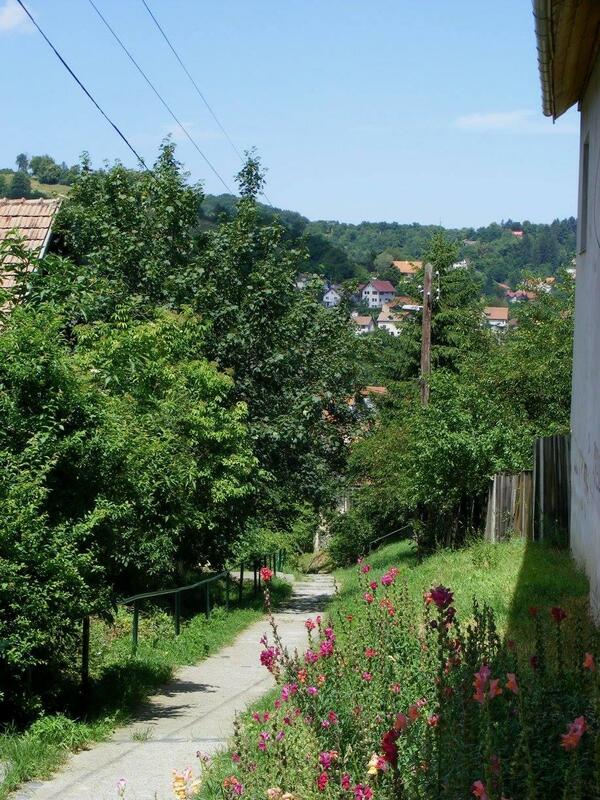 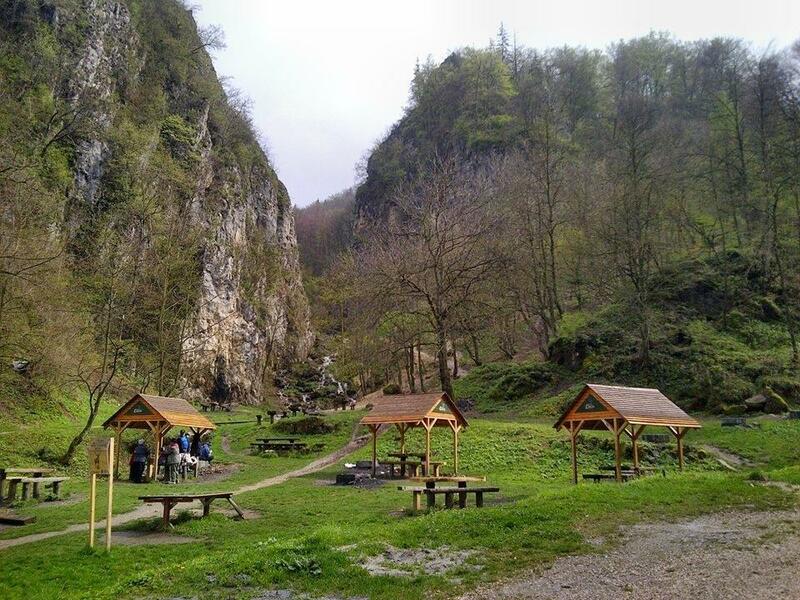 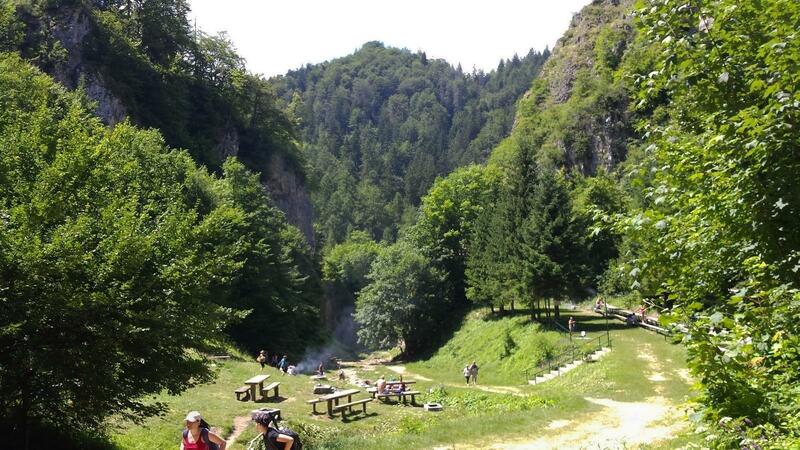 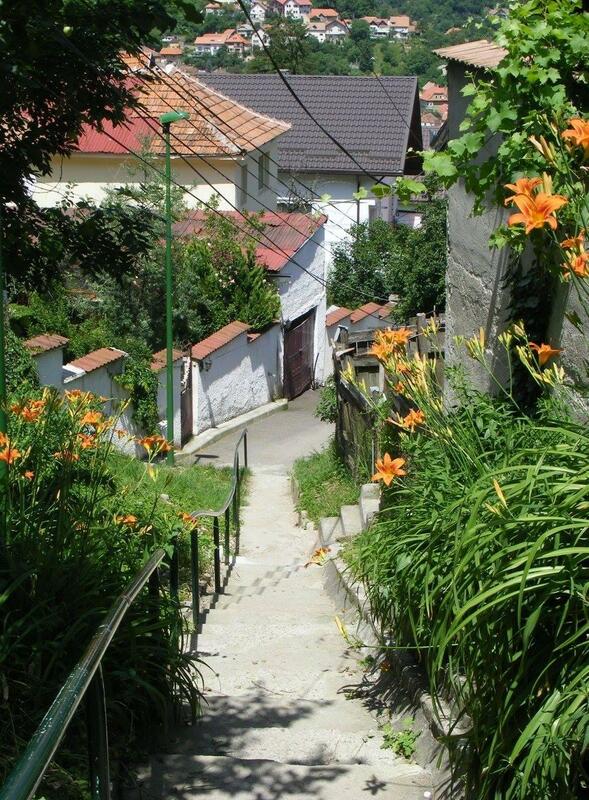 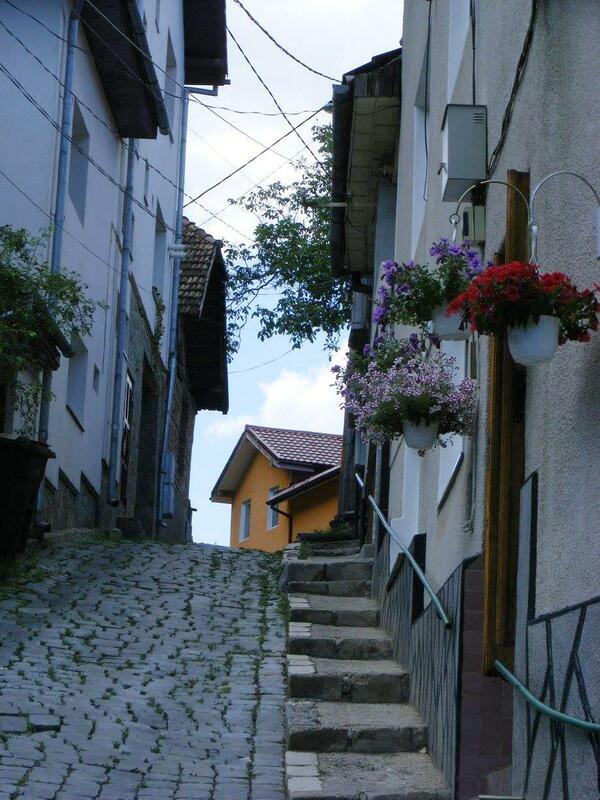 The street that lead to Solomon’s Rocks was called the Valley of the Water Mills (Valea Morilor). 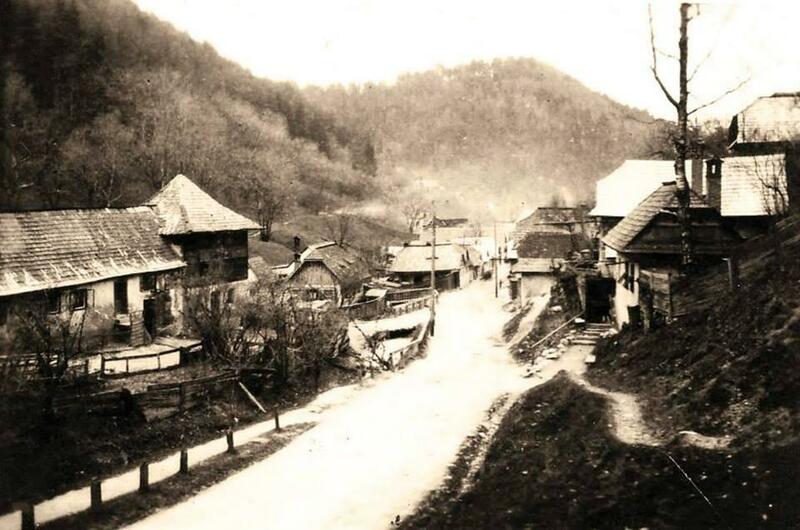 “Capul satului” (the end of the village), when the settlement spread along Solomon river all the way up to Solomon’s Keys. 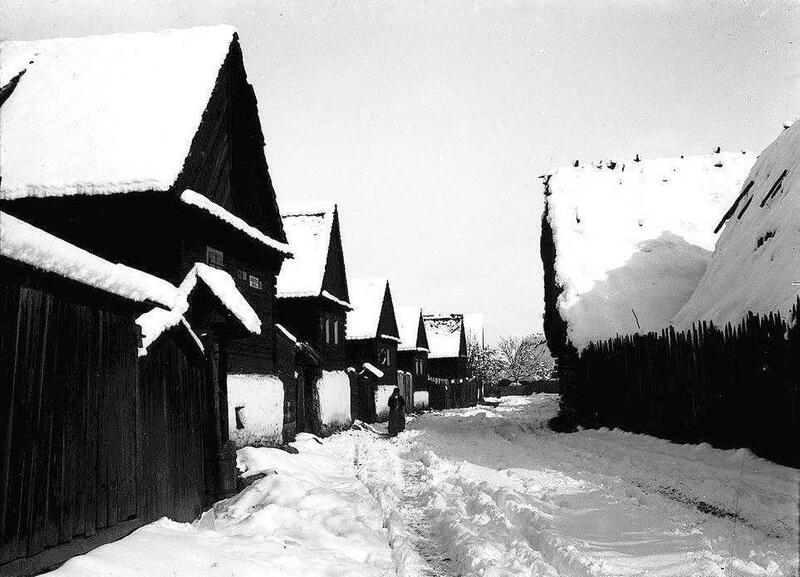 Up until early the XXth century tourism developed, the old Schei village used to spread along Solomon river up to Solomon’s Rocks. 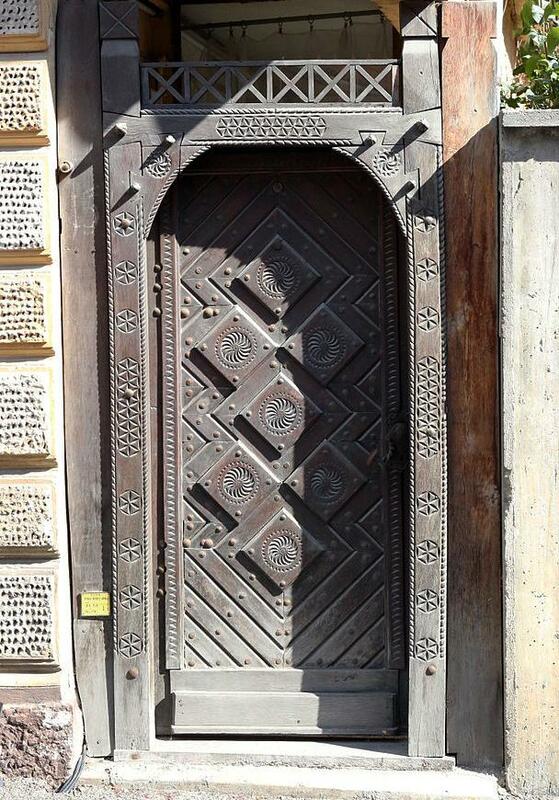 The old houses of Schei have traditional Romanian wooden gates, some dating back to the XVII century; they are sculpted with astronomical motifs that are believed to protect the house. 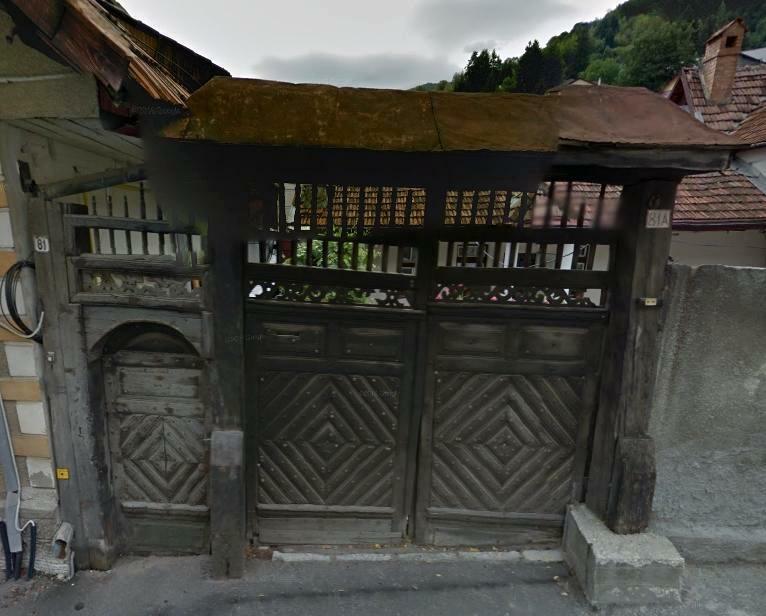 Some of the deteriorated wooden gates were replaced with metal gates. 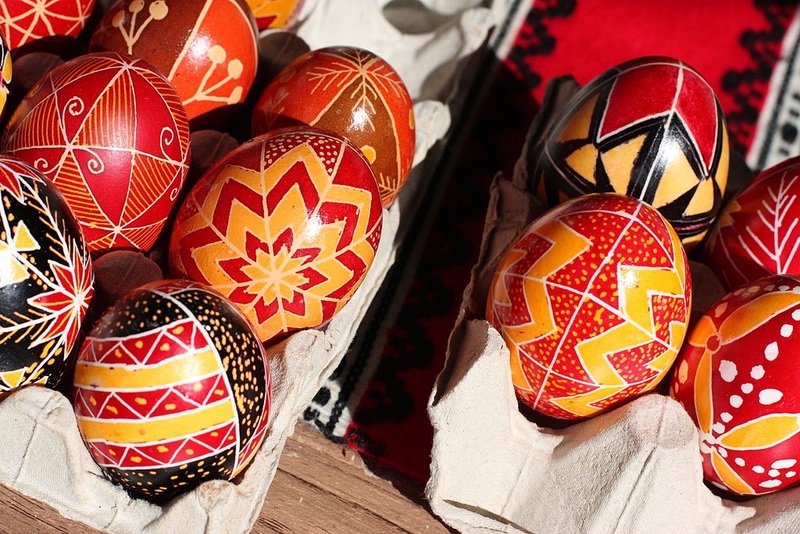 Solar motifs stemming from ancient pre-Christian belief in the cult of the sun, much like the pre-Christian traditions still practiced today by the Juni. 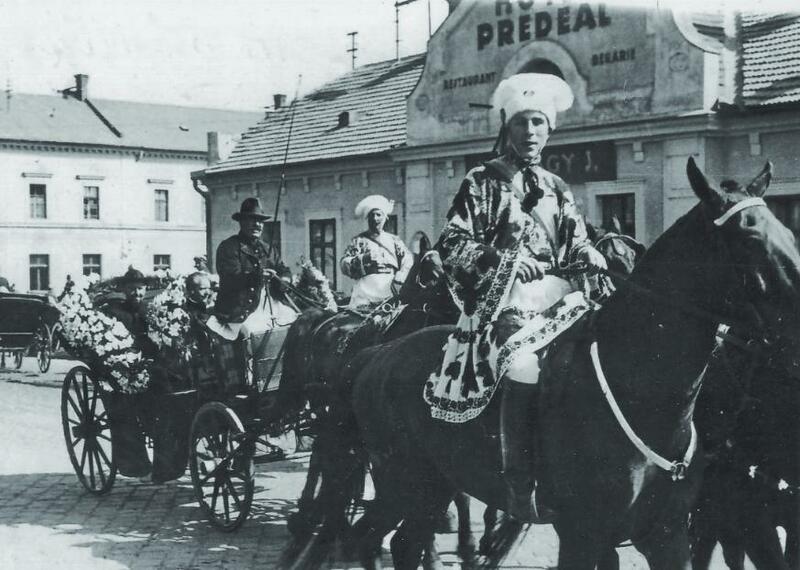 Unlike the men of Schei who kept the traditional Romanian costume pieces, the Schei women’s clothing had a strong urban influence which reflected the community’s proximity to a flourishing commercial center.